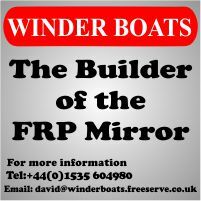 Mirror 70447 "Fever" (thanks Ash) is a Trident-UK GRP "Mirror Race" built in 2006 and owned by Restronguet SC since 2010. 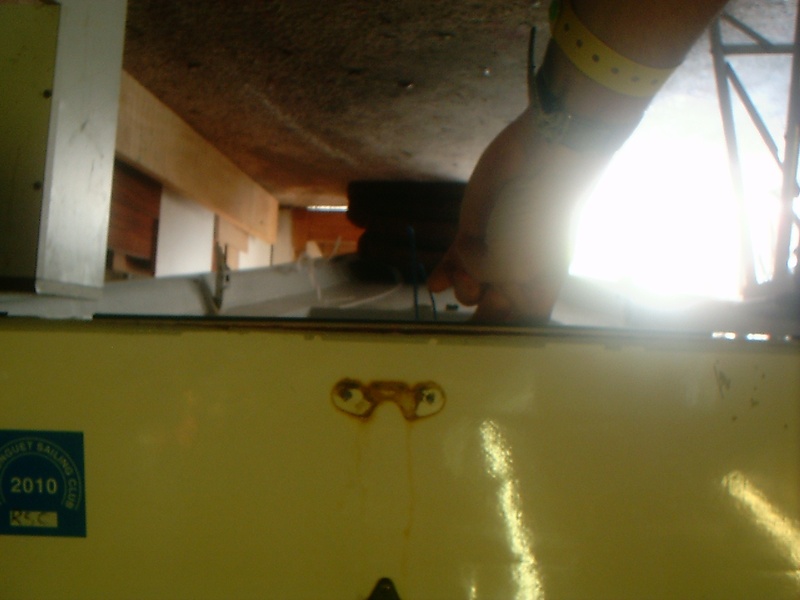 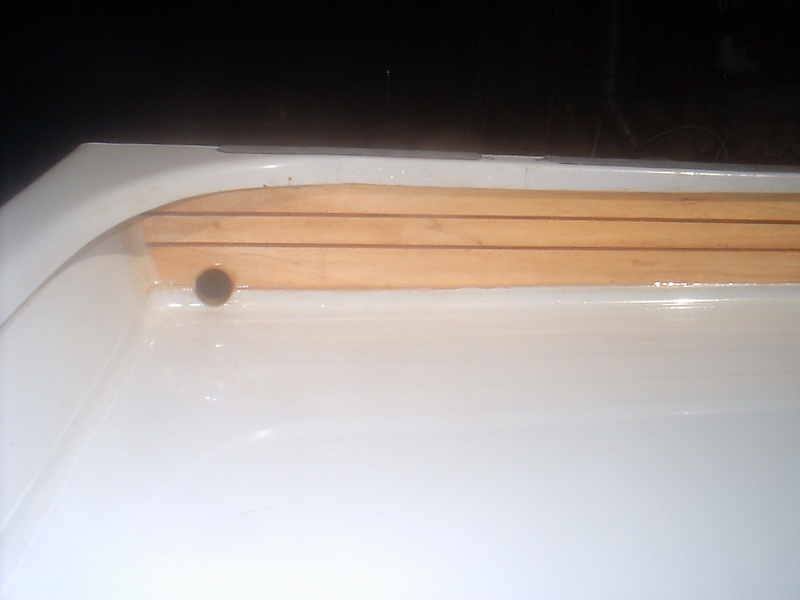 In 2012 I was undertaking some routine maintenance and I noticed a horizontal crack along the top of the vertical moulding lip of the aft deck where it joins the inside face of the transom. 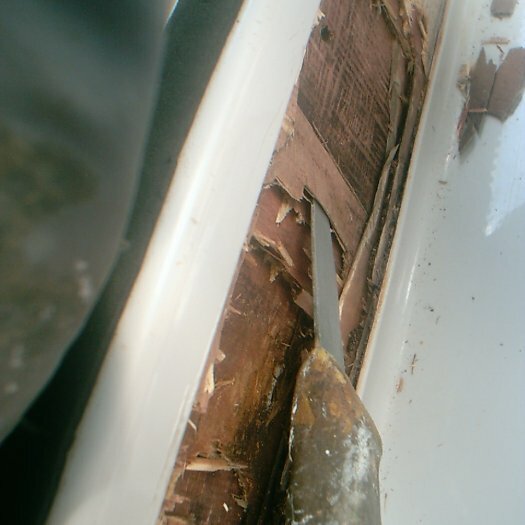 At first glance it looked like the deck mould was coming away from the transom, but on closer inspection I found other cracks on the inside face of the transom well above the deck mould level, and it became clear that the grey surface of the inside of the transom was not really attached to the layer underneath. 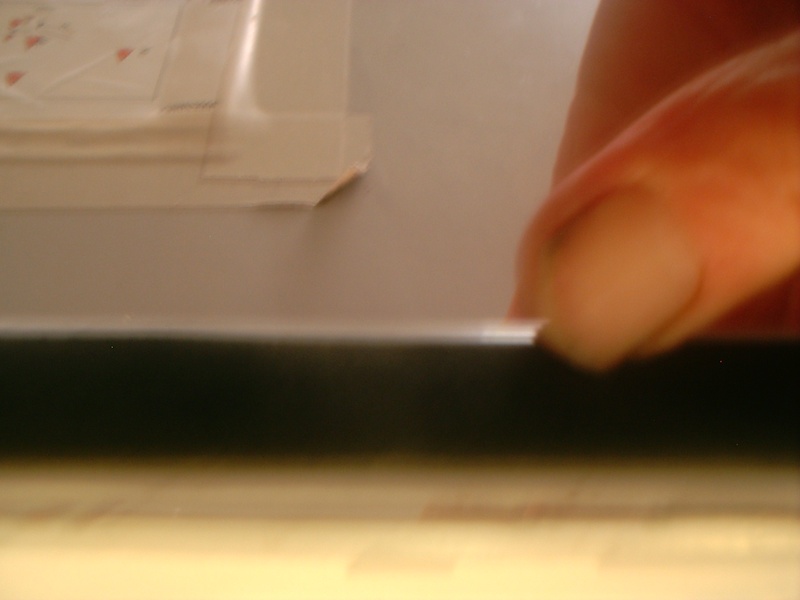 I was able to break up/peel off the grey layer very easily. 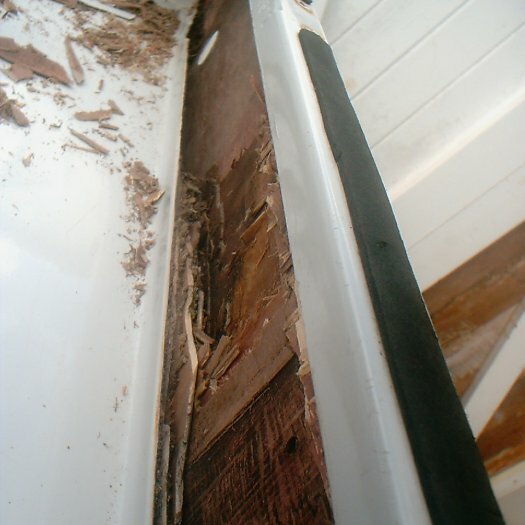 I found that the layer removed was a single plywood laminate with grain running horizontally. 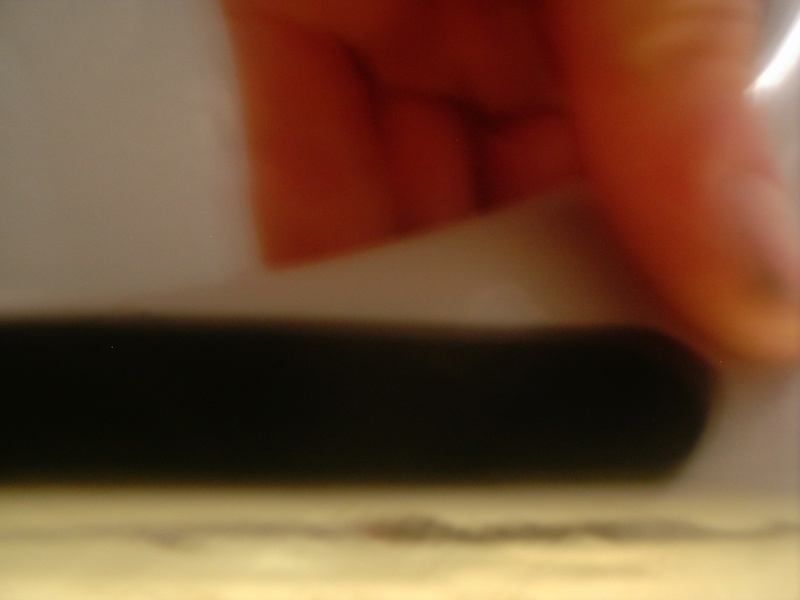 I understand the surface is resin coated and flow coated in grey. 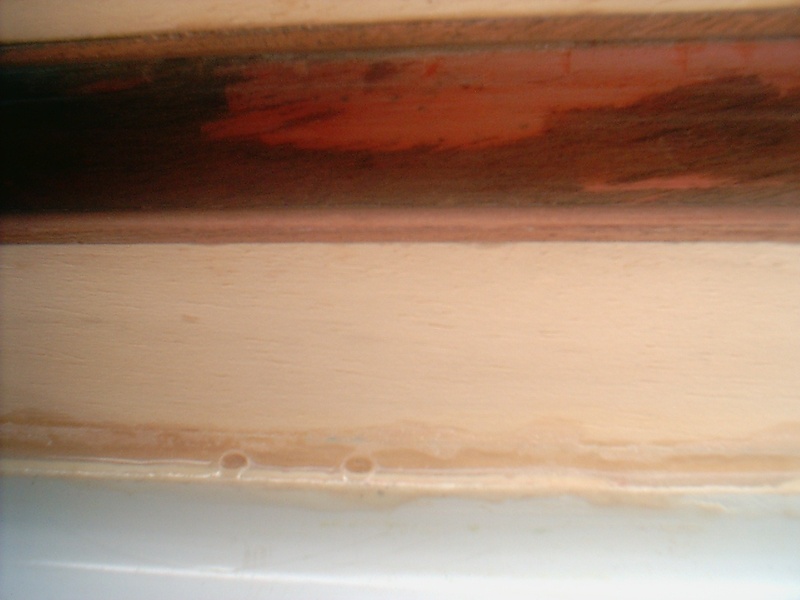 Some water had got under the top laminate of the ply as it was quite damp and discoloured as was the next layer down. 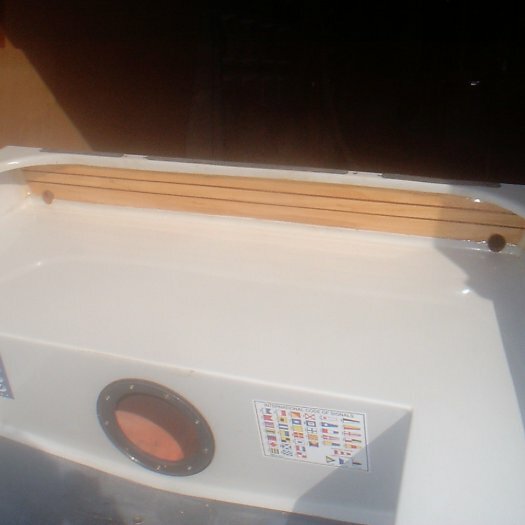 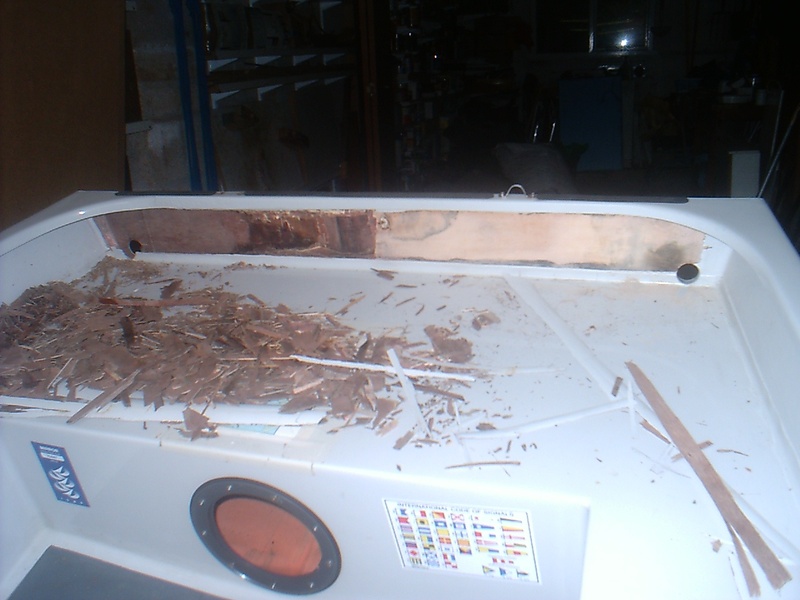 It was now clear that the inside of the transom (the doubler) is plywood and the aft deck moulding lip is glued to this. 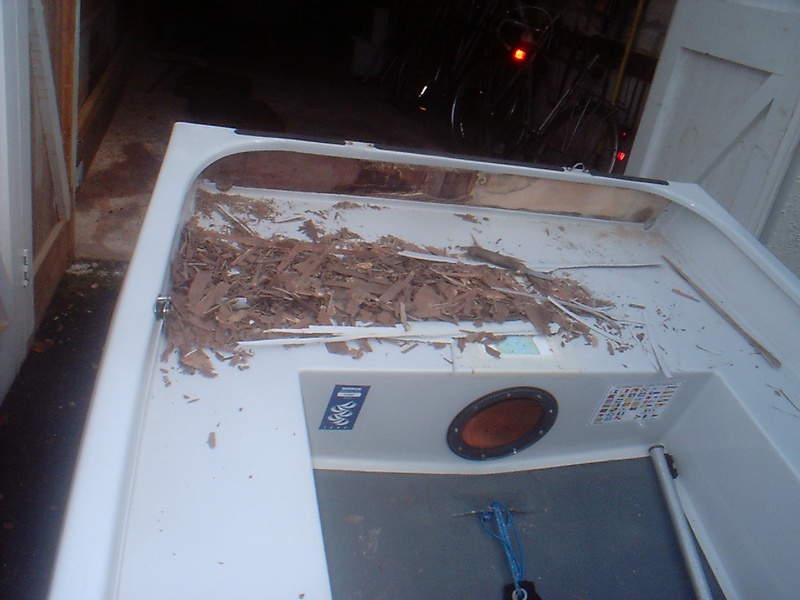 I left the boat in my garage to dry out for a few days. 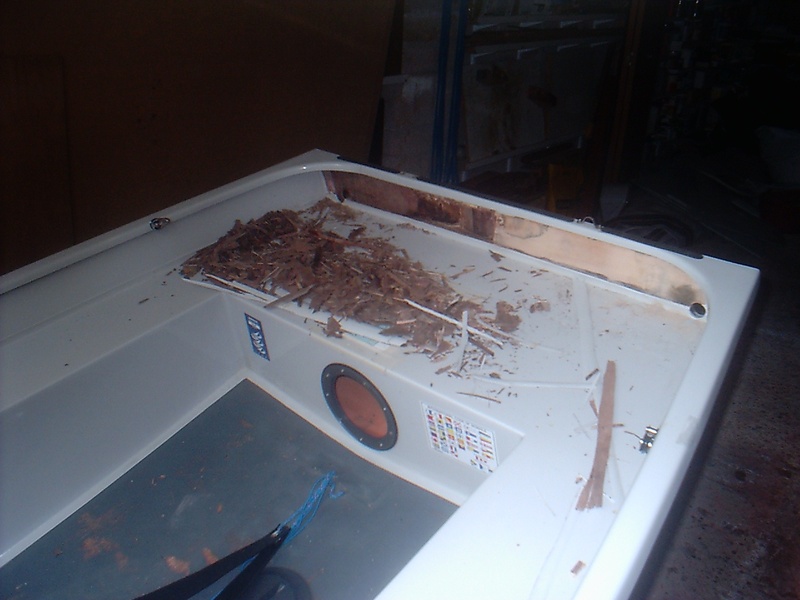 Some parts of the transom did dry out. 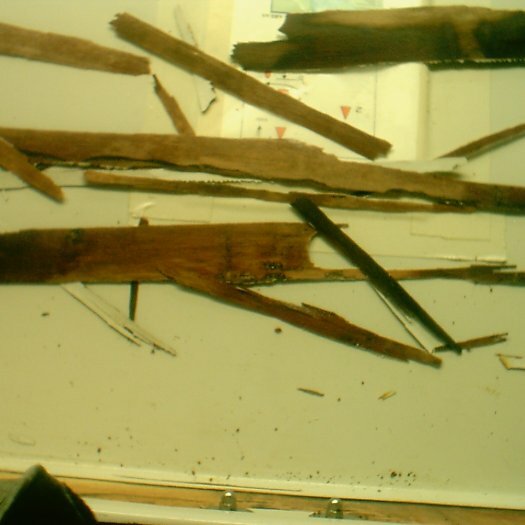 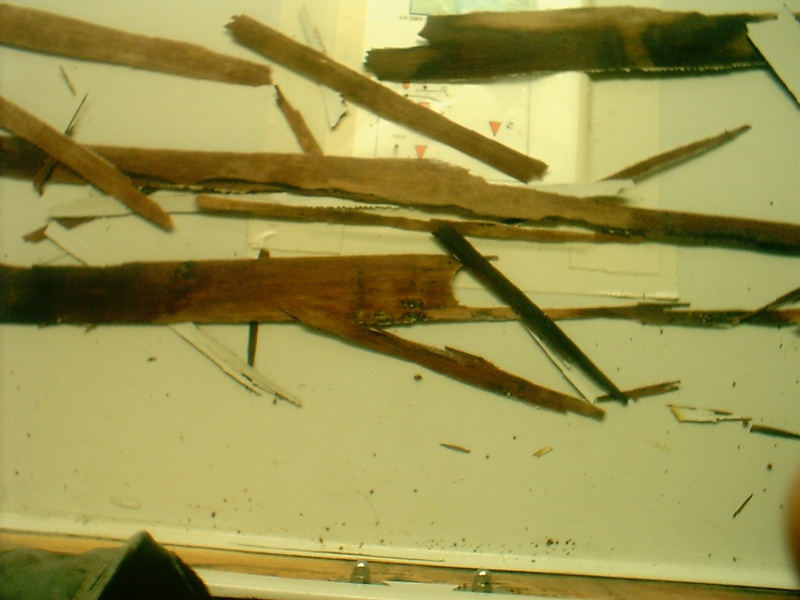 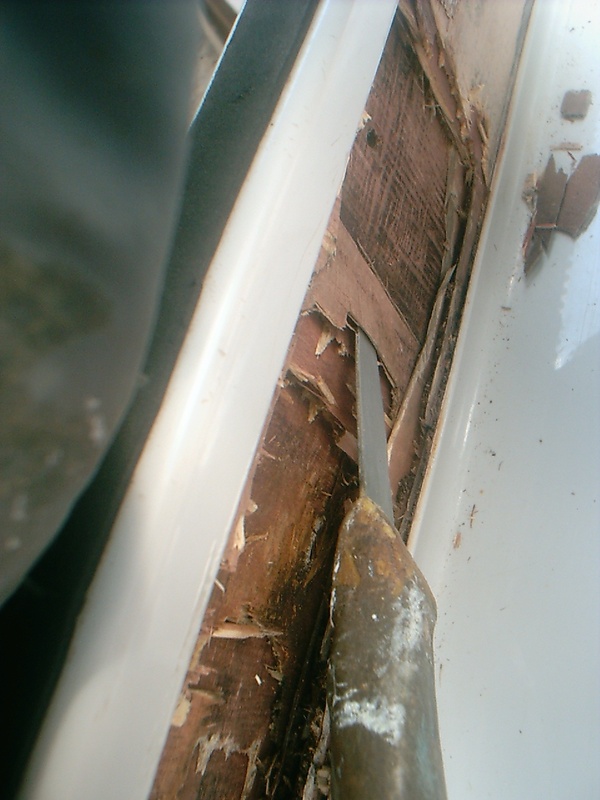 But the starboard side, extending about 1/3 of the way across the transom ply was still saturated with water and upon closer inspection the next layers down were also delaminating (and possibly the wood starting to rot). 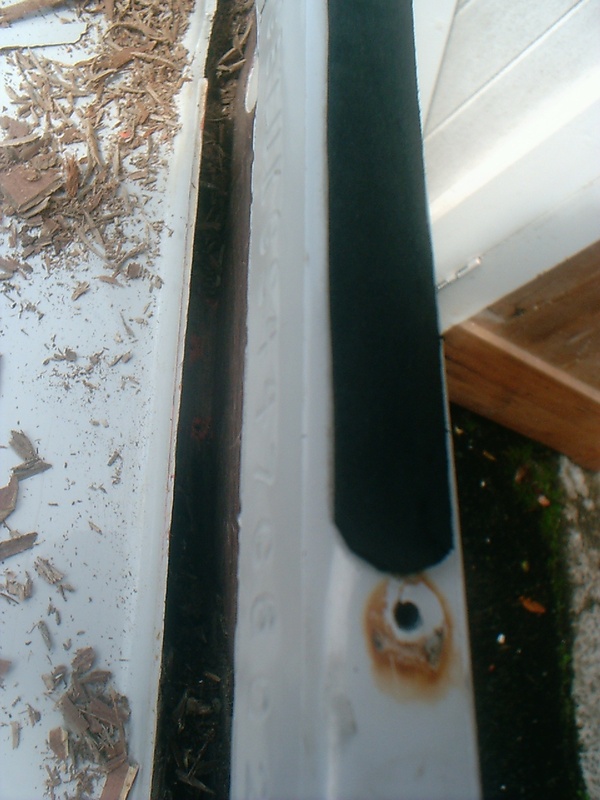 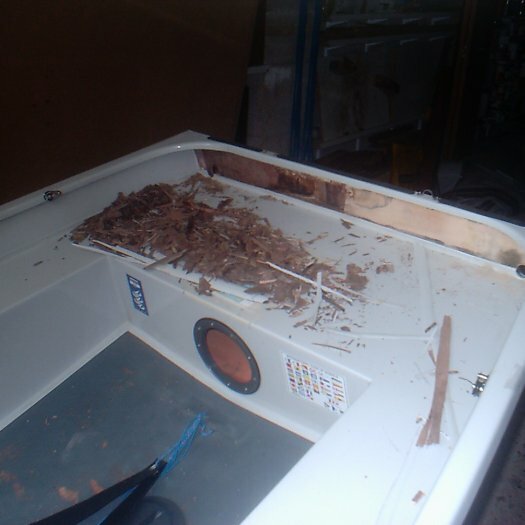 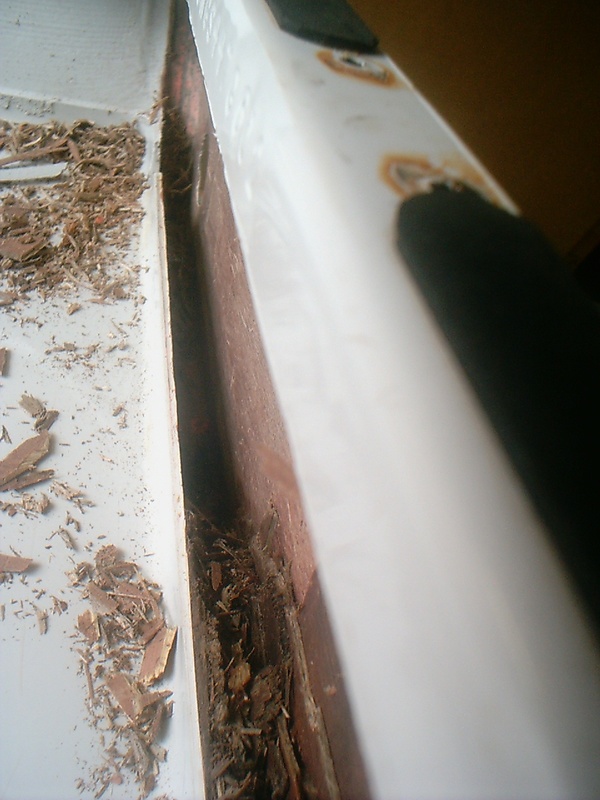 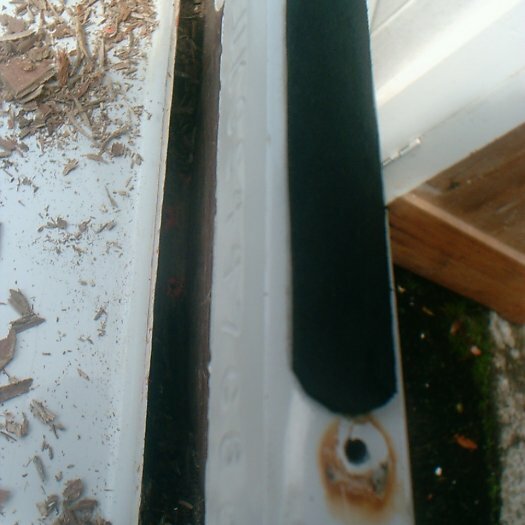 On the previous photos, this is the area which is dark brown or black, compared the most of the transom which is beige. 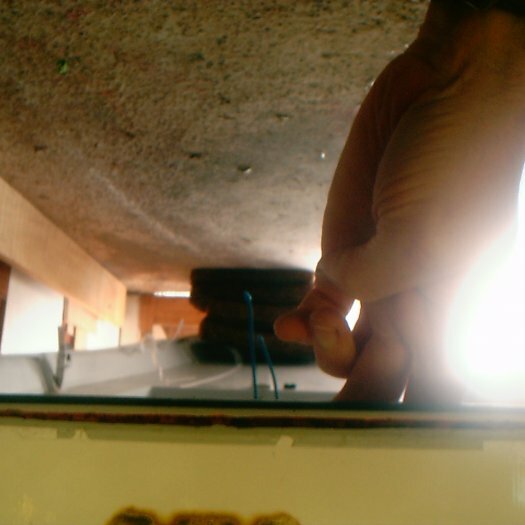 I started to remove the delaminated layer (grain running vertically) to investigate further and found the same situation with the next layer down (grain running horizontally). 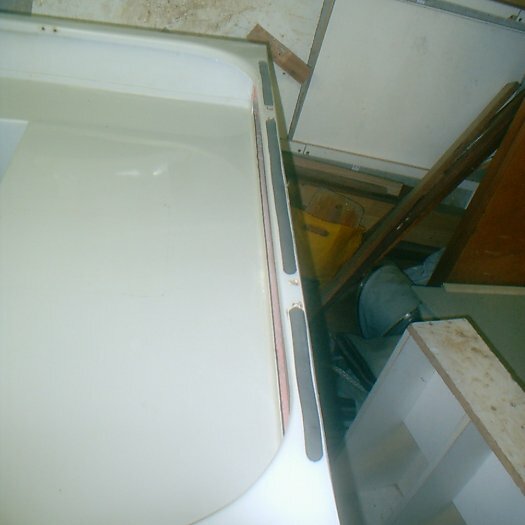 It was saturated with water and had delaminated. 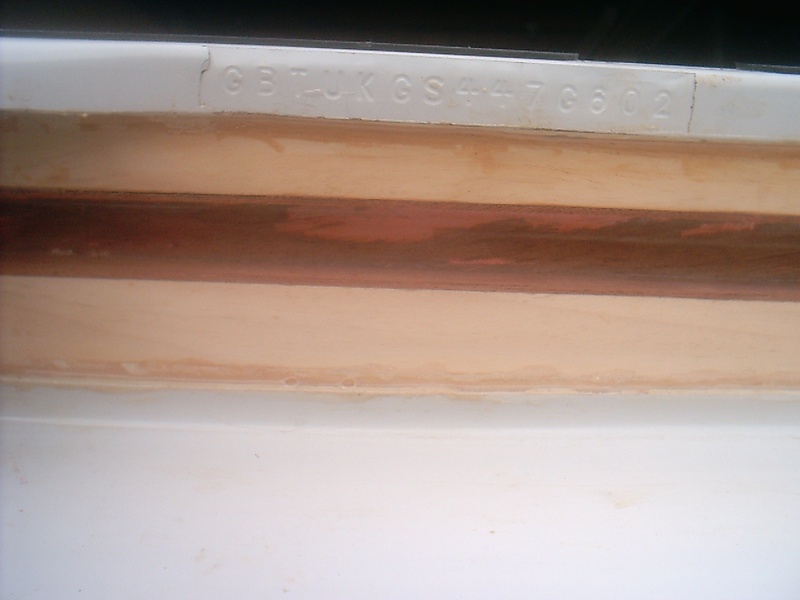 I continued and the story was the same all the way through to the inside of the GRP skin of the transom (hull moulding). 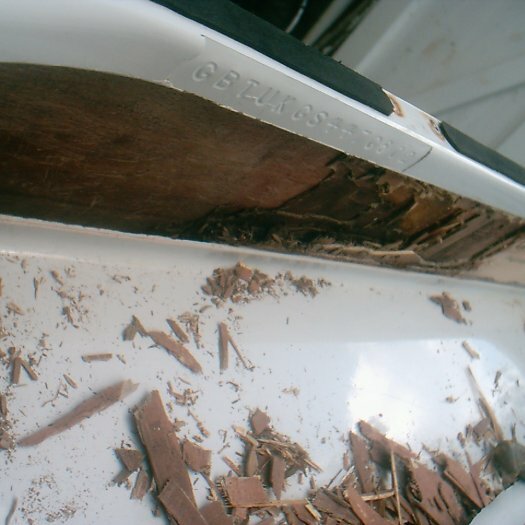 I also dug down vertically behind the lip of the aft deck and the story was the same all the way down to where the ply stops and the construction changes to foam sandwich over the lower part of the transom panel. 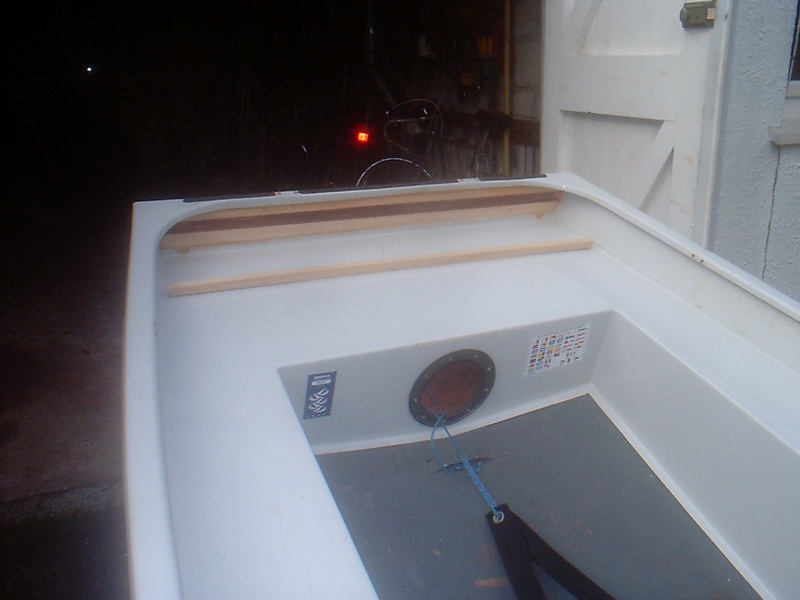 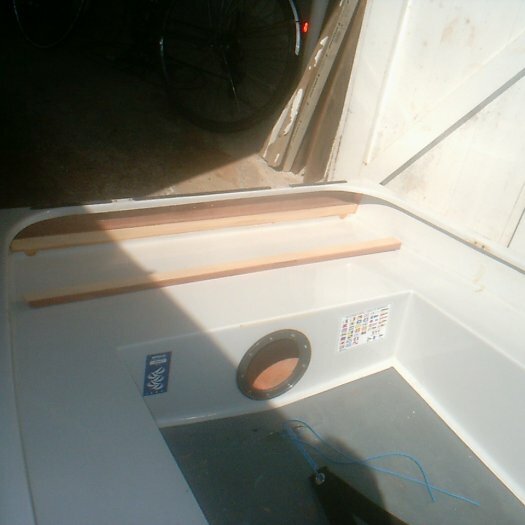 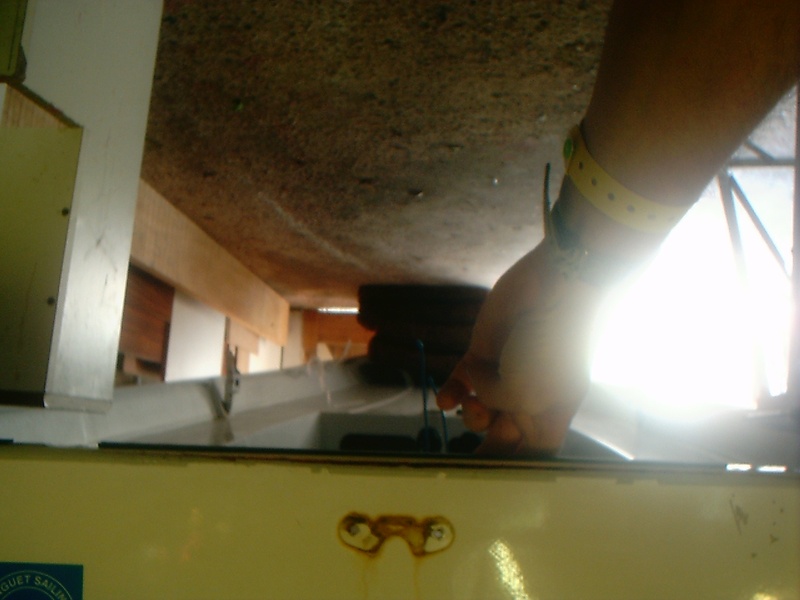 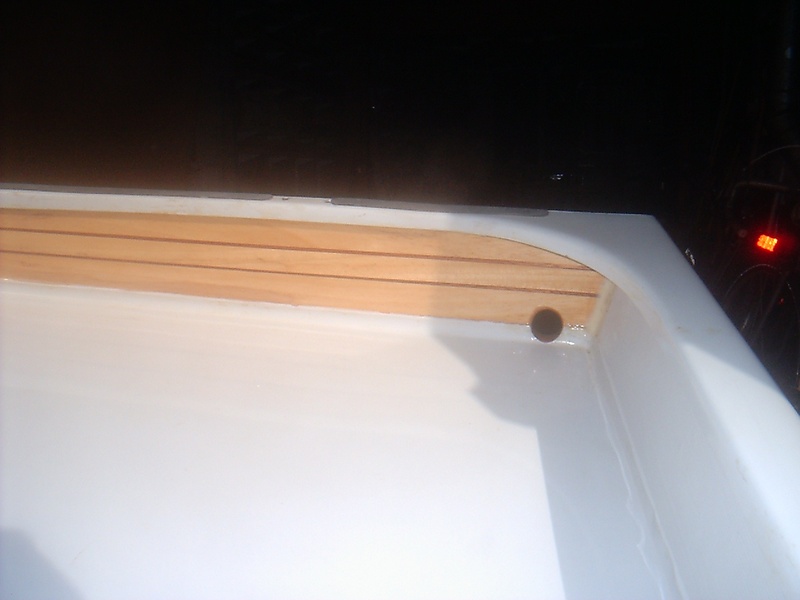 I also investigated upwards where the ply runs up to meet the gunwale/quarter knees/ transom top surface moulding. 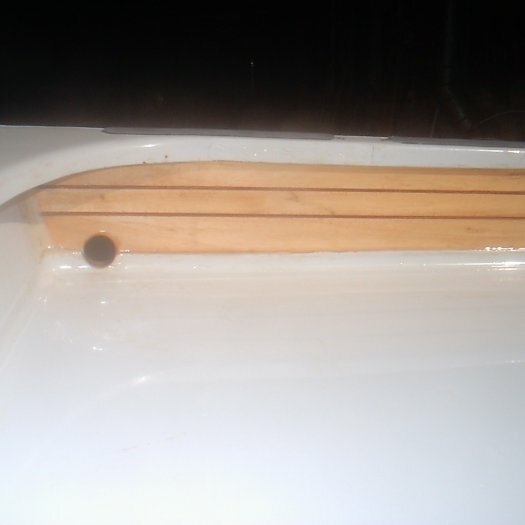 Here the ply was less saturated with water, but had also delaminated all the way up. 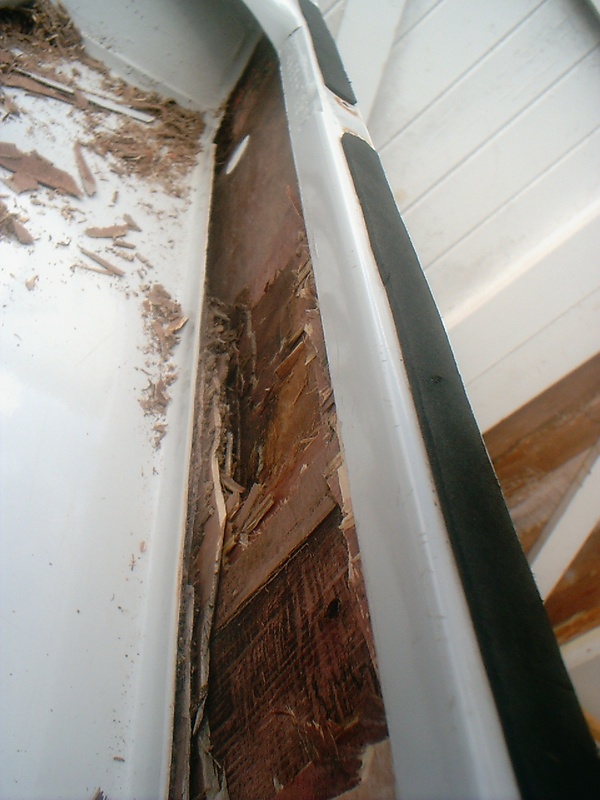 I investigated the ply covering the remaining 2/3rds of the transom. 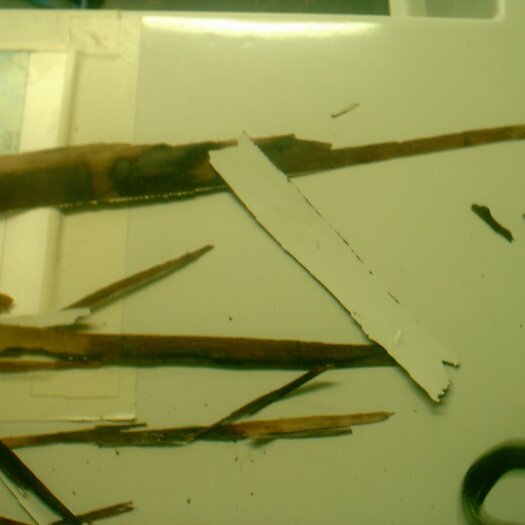 This was dry, apart from an small area near the port drainage hole. 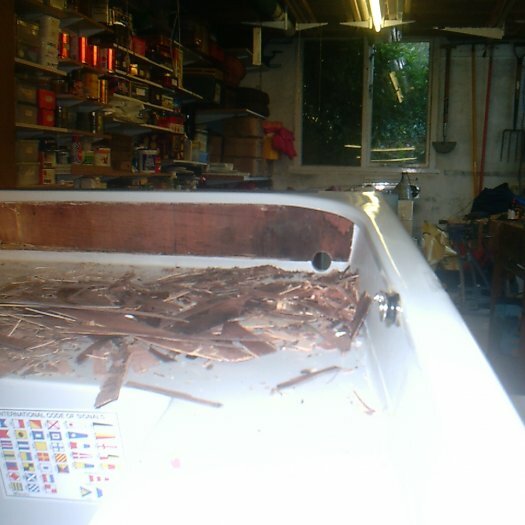 However, even here the ply had delaminated, I could lift each layer of ply away from the one underneath with a knife. 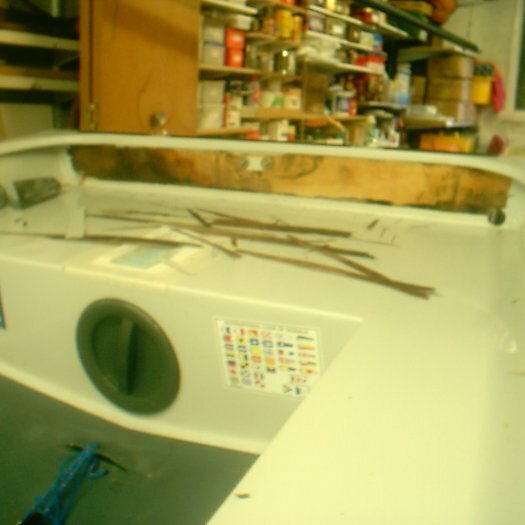 The only thing holding it together is that it was being clamped by the deck moulding lip at the bottom and the gunwale/quarter knees/transom top surface moulding at the top. 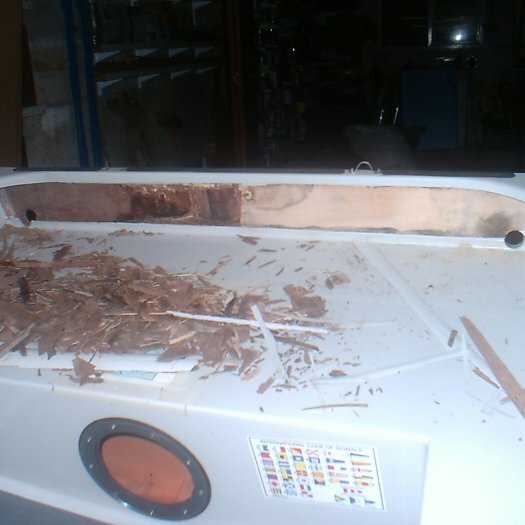 As you can see from the photos, all the pieces removed were a single layer of ply laminate. 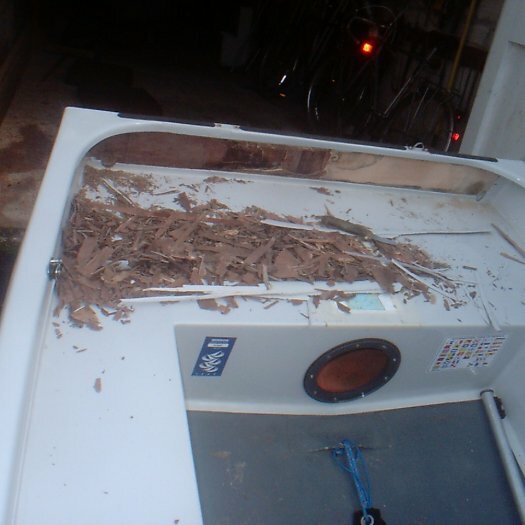 It was not a case that the ply had simply torn. 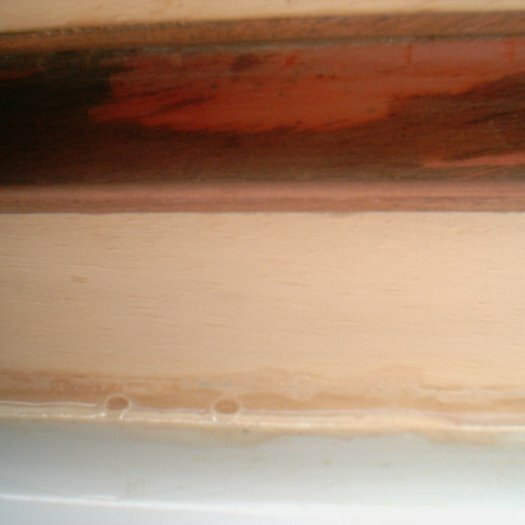 The bond between the resin and the ply was stronger than the bond between the layers of ply, but that was because there appeared to be nothing bonding the layers of the plywood together. 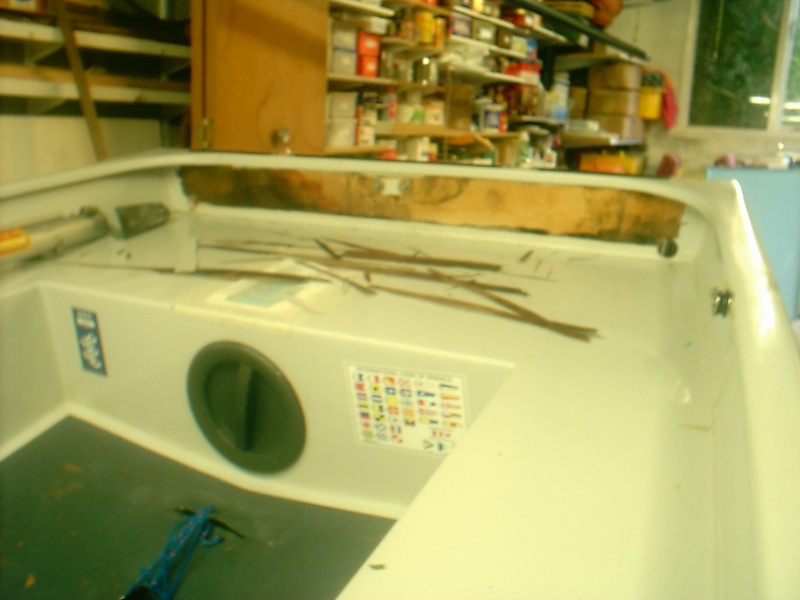 As far as I can see the only option to repair was to remove all the ply, piece by piece, layer by layer, including the part behind the aft deck lip and right up under the transom top edge moulding, taking care not to damage the mouldings and replace it. 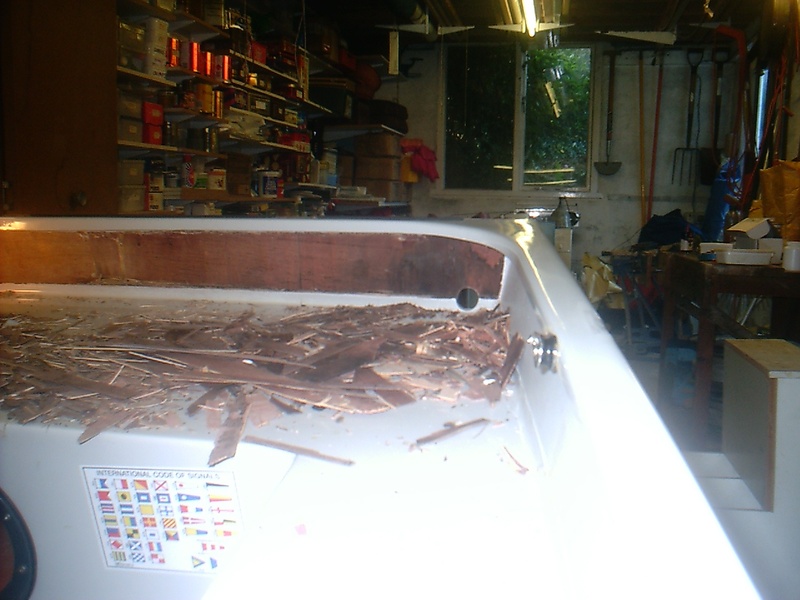 So that's what I did, removing all the pieces of the plywood including those extending down about 40mm below the lip of the aft deck moulding. 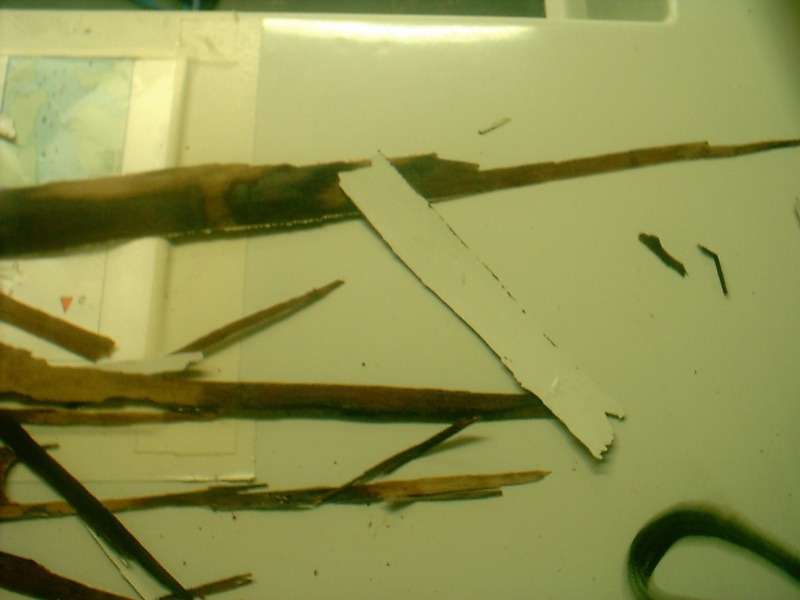 This was pretty difficult, but is possible with a sharp narrow chisel, some mirrors, wander lamp, sharp knife and a lot of patience. 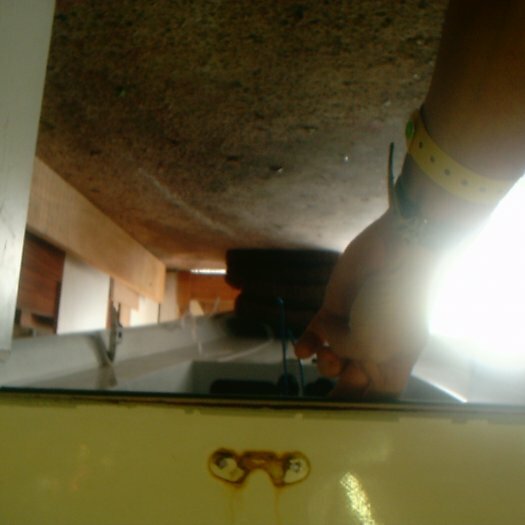 The process was not helped by some screws holding a length of battern inside the aft tank to the bottom of the doubler. 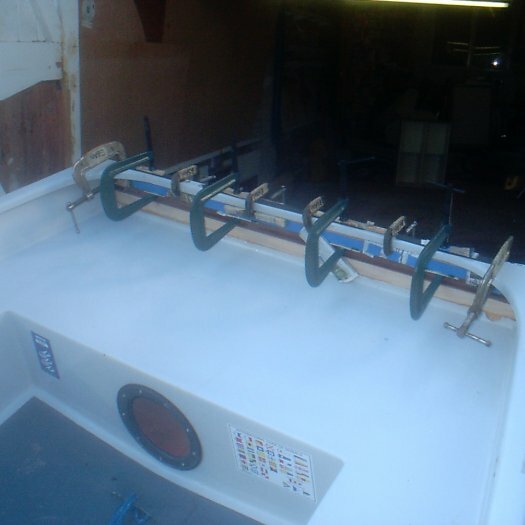 Luckily Trident-UK had used posidrive headed screws, so with the boat supported on cushions and sitting inside the cockpit it was just possible to reach and remove all the screws. 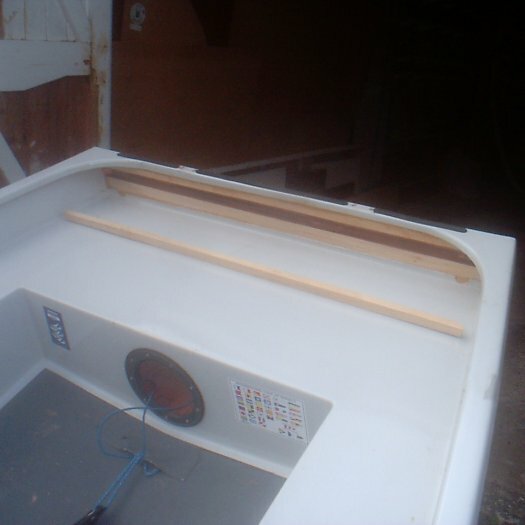 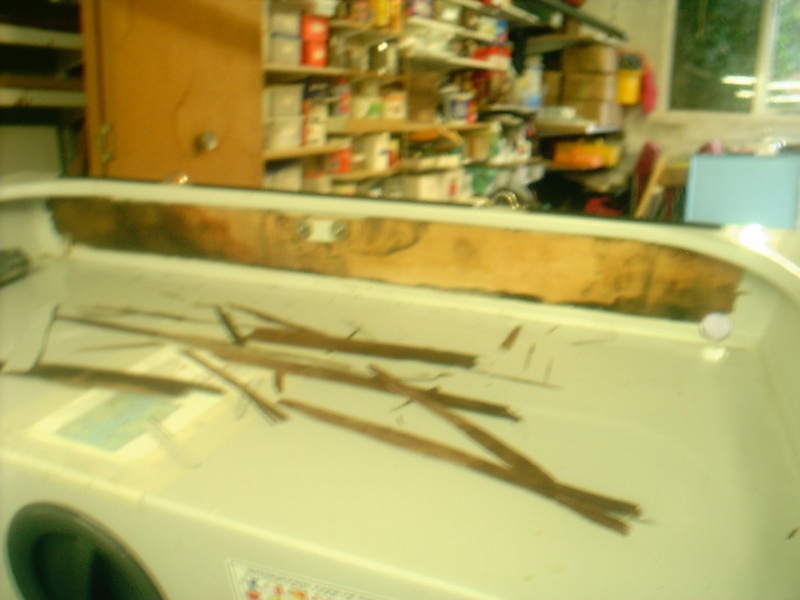 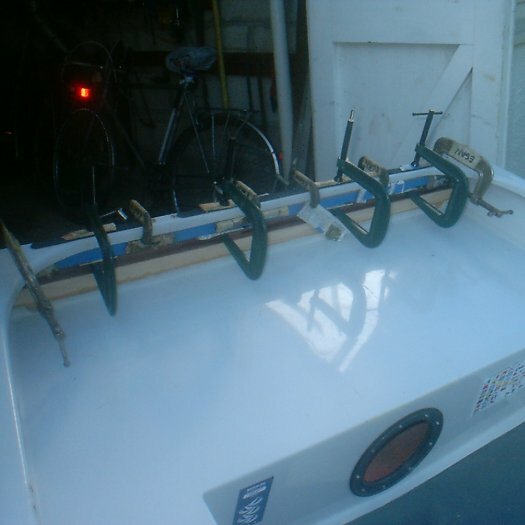 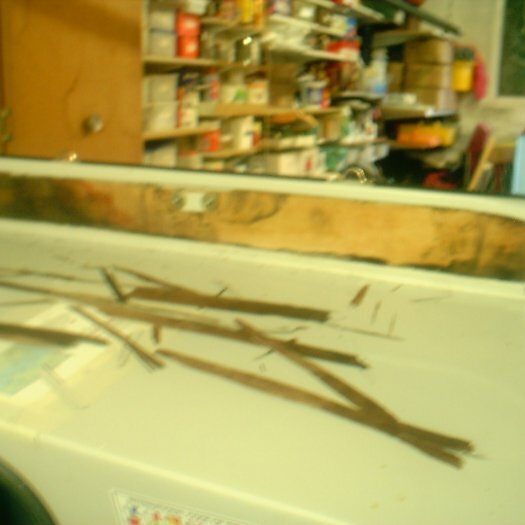 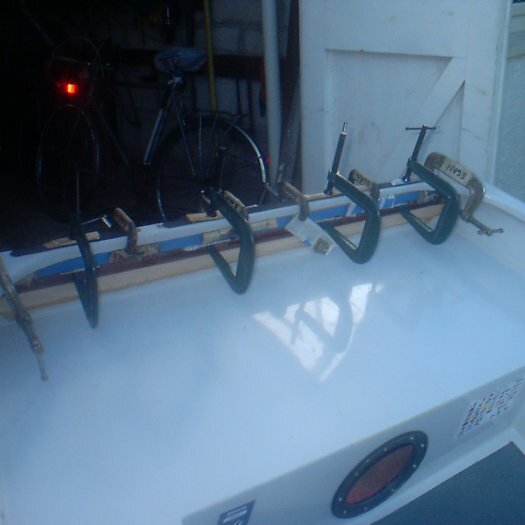 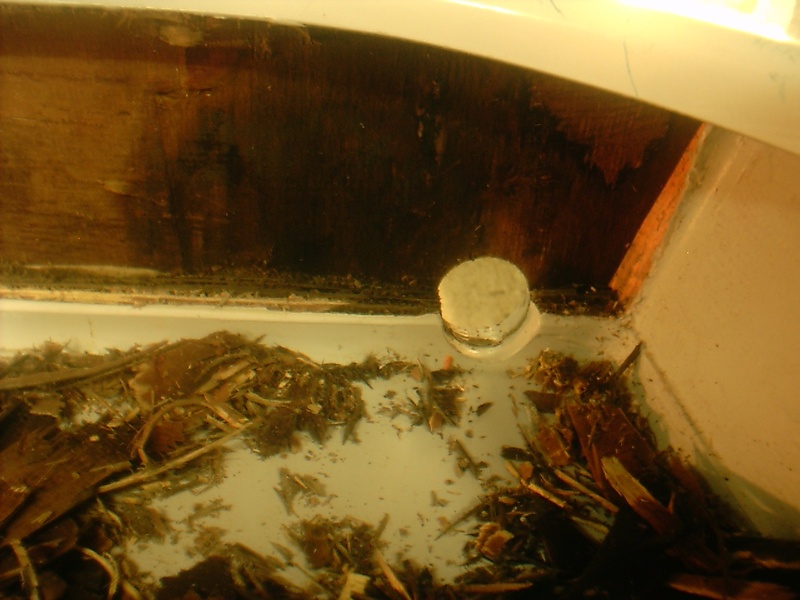 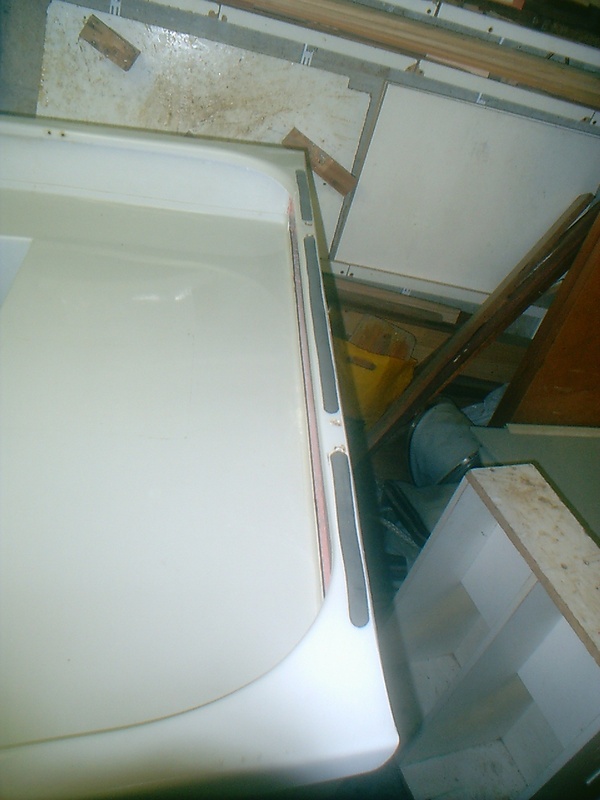 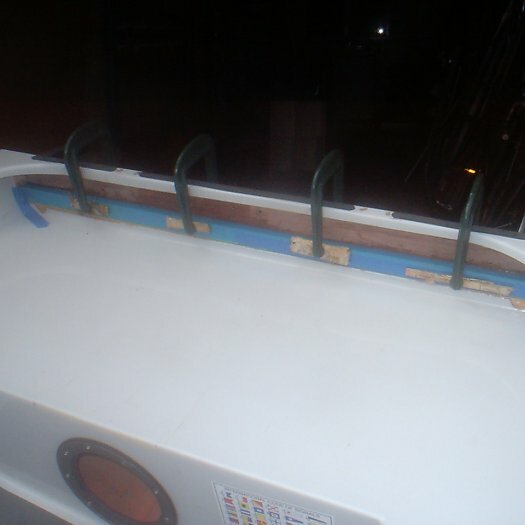 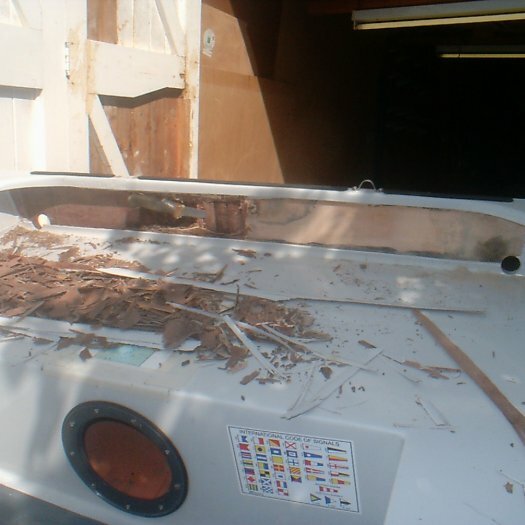 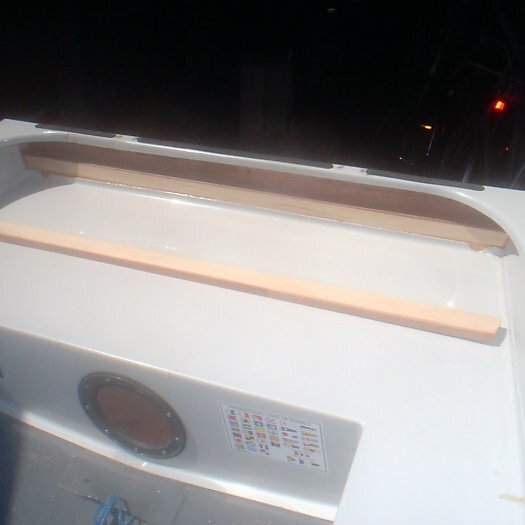 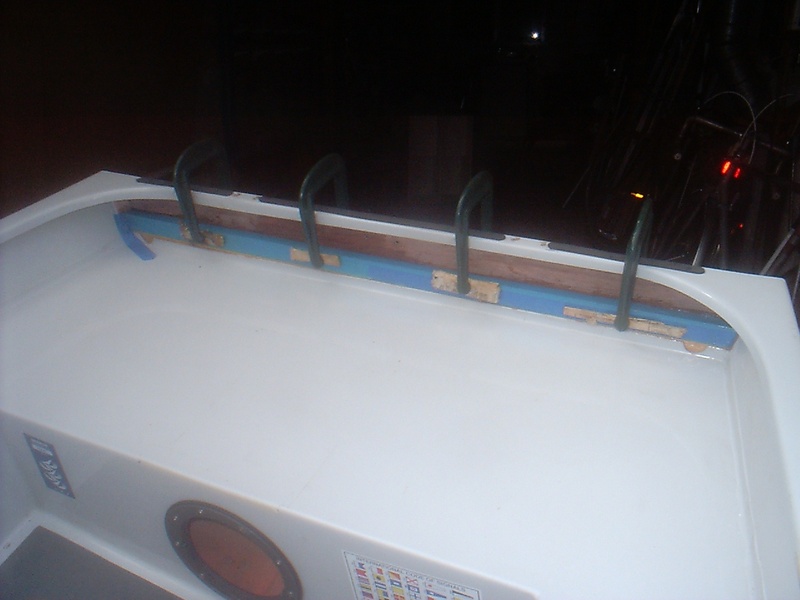 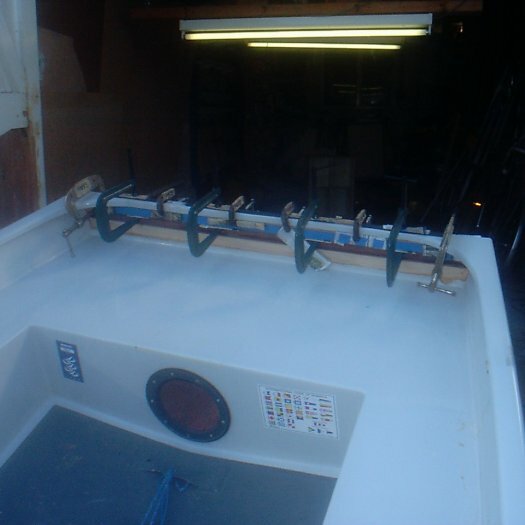 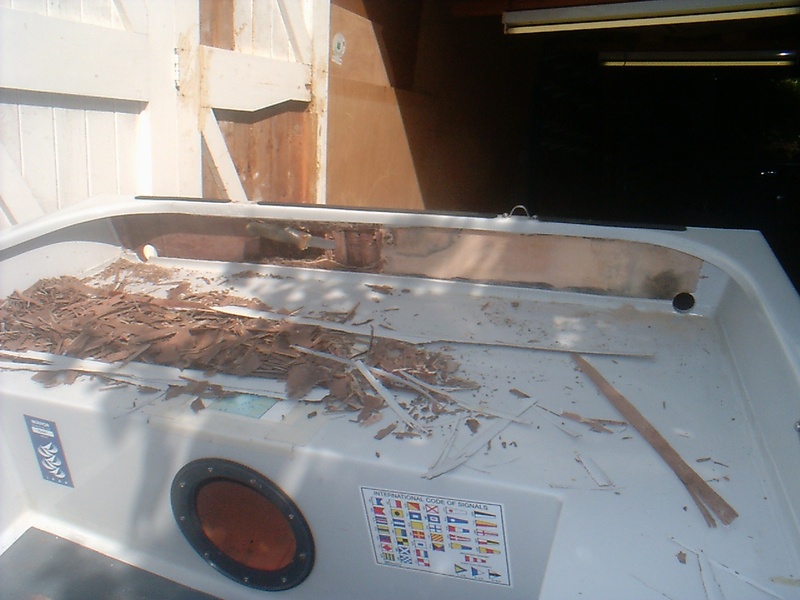 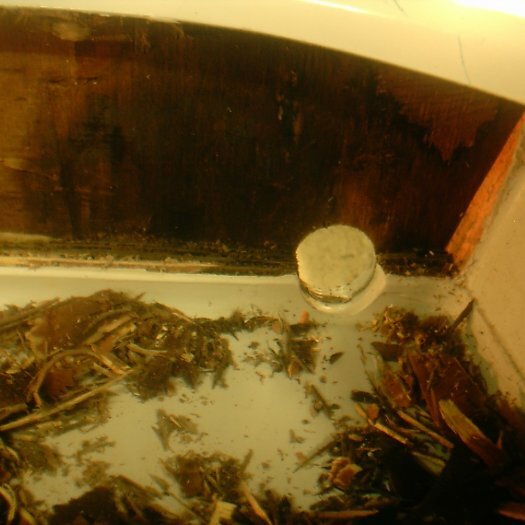 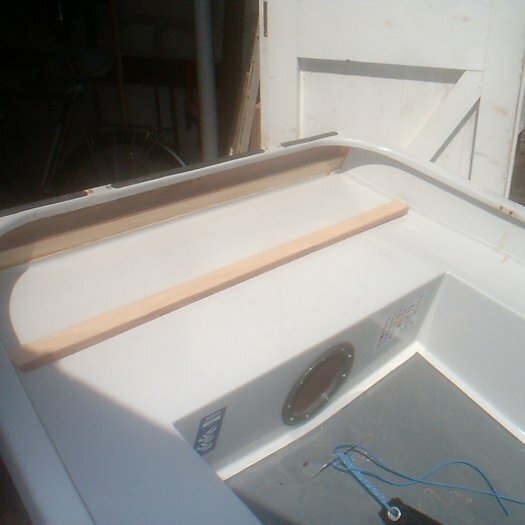 With the plywood removed, it became clear that there was now nothing really holding the edge of the transom top edge moulding to the top edge of the hull moulding. 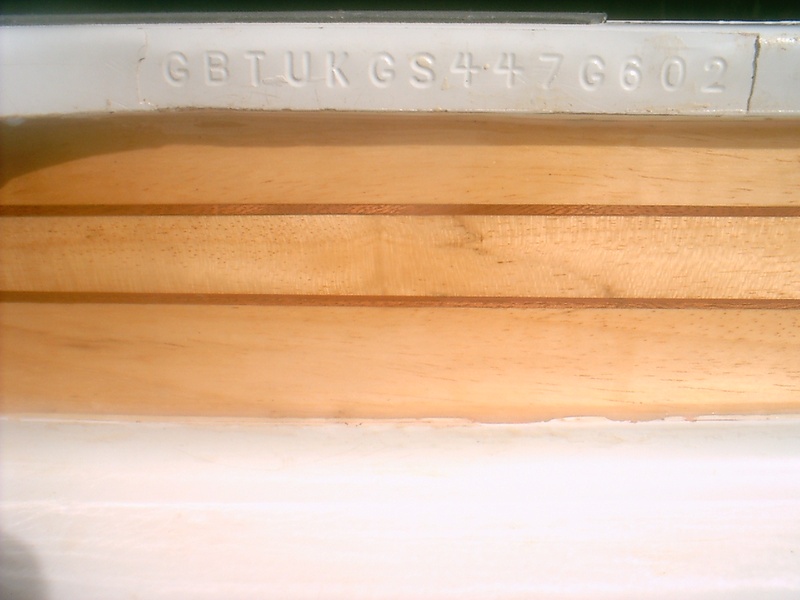 Normally the plywood doubler holds these two edges together and there is just some gel/flow coat over the join. 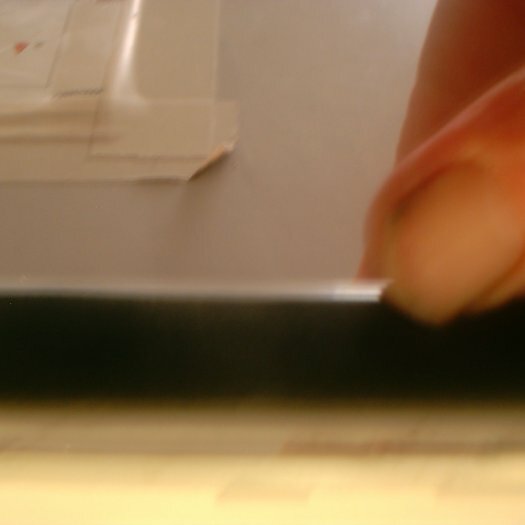 The photos are not great, but you can see the horizontal crack that I needed to repair. 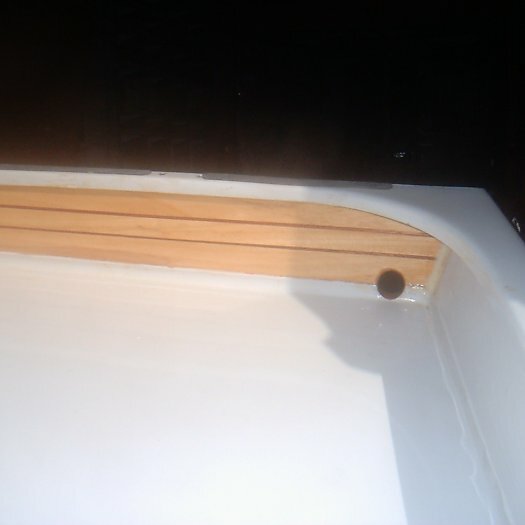 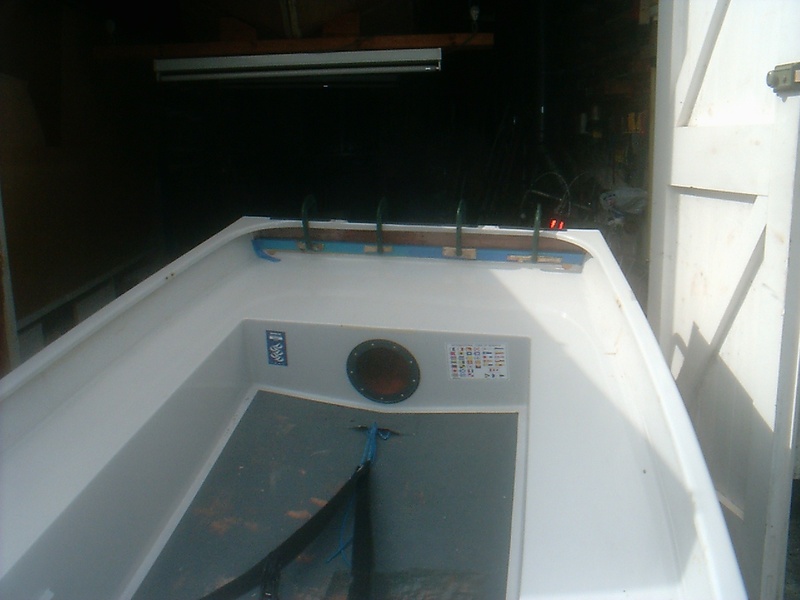 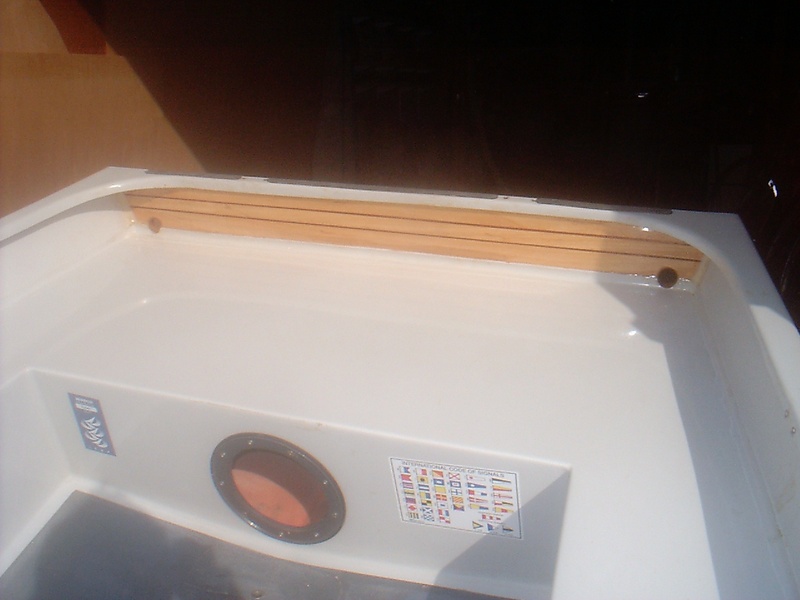 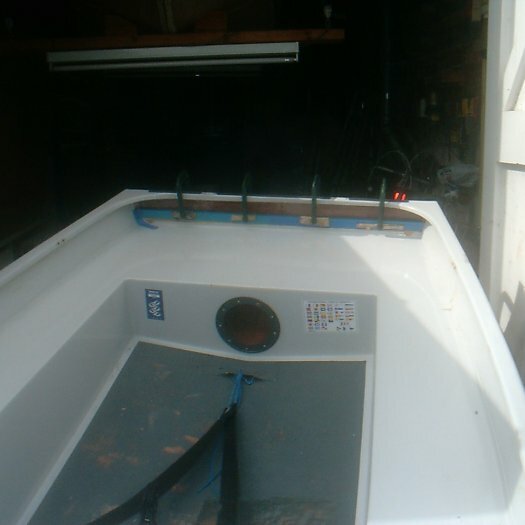 I decided to turn the boat over, used masking tape to hold the edges together temporarly and put an epoxy fillet along the inside of the transom top edge moulding and the top inside edge of the transom. 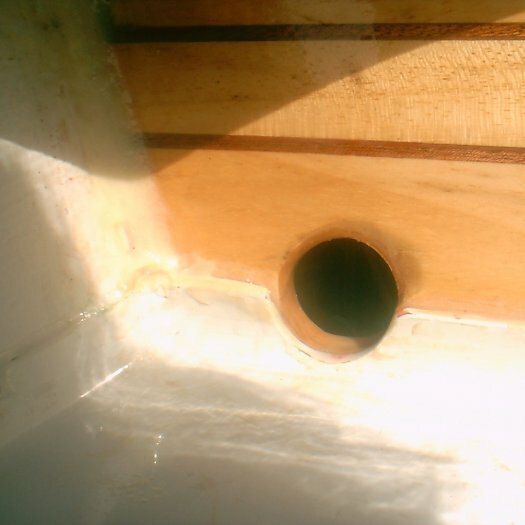 The fillet not visible from the outside and because of the proximity of the aft deck, can only be glimpsed using a mirror to look inside the transom top edge moulding. 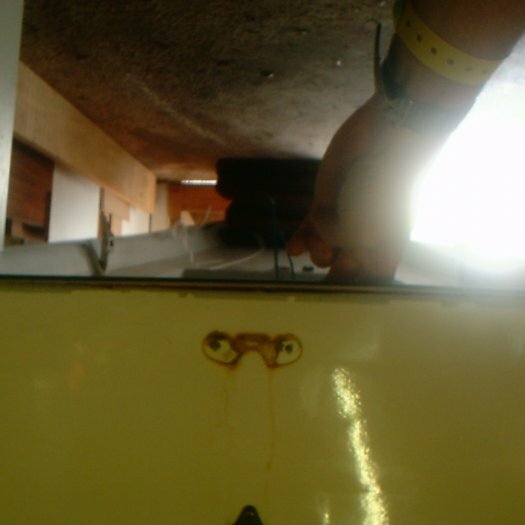 It had to be applied "blind", I could only see what I had done, via a mirror, after I had finished. 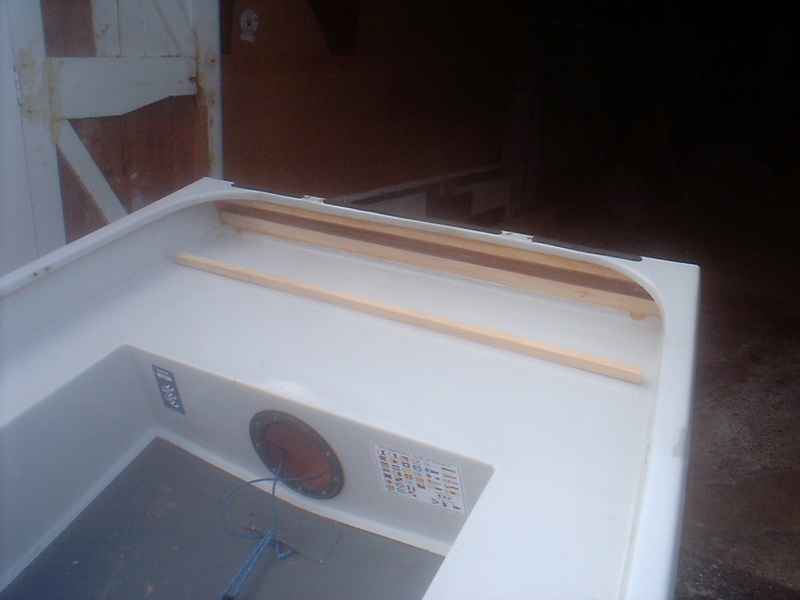 However, the result was excellent and the transom top edge to transom top edge join was now really solid. 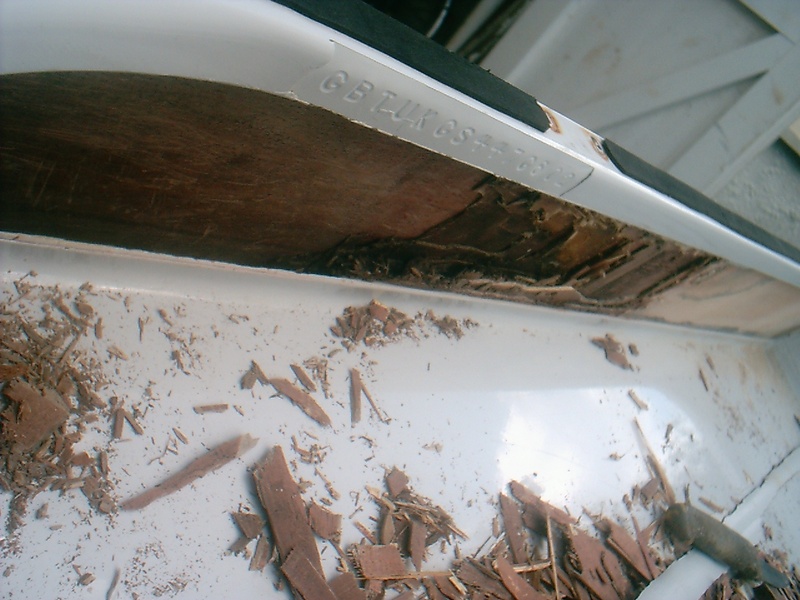 I tidied up the fillet with sandpaper as best I could to make a smooth and even surface for the replacement doubler to mate with. 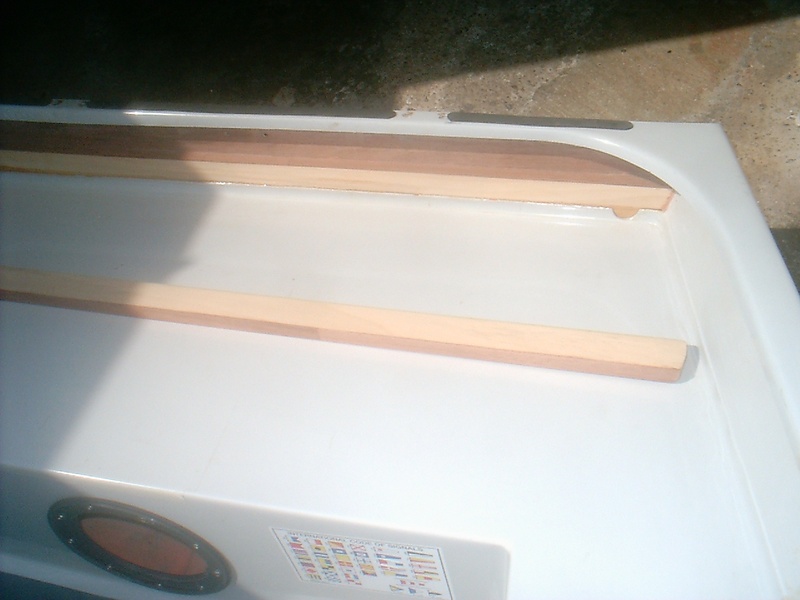 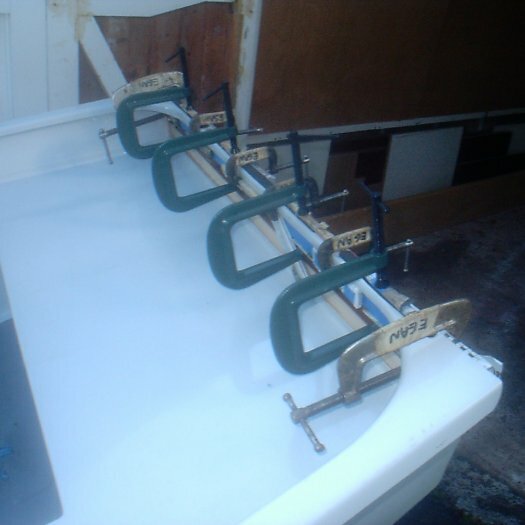 I decided to use obeche for my new doubler as per the best wooden boats, to keep weight to a minimum and out of the ends. 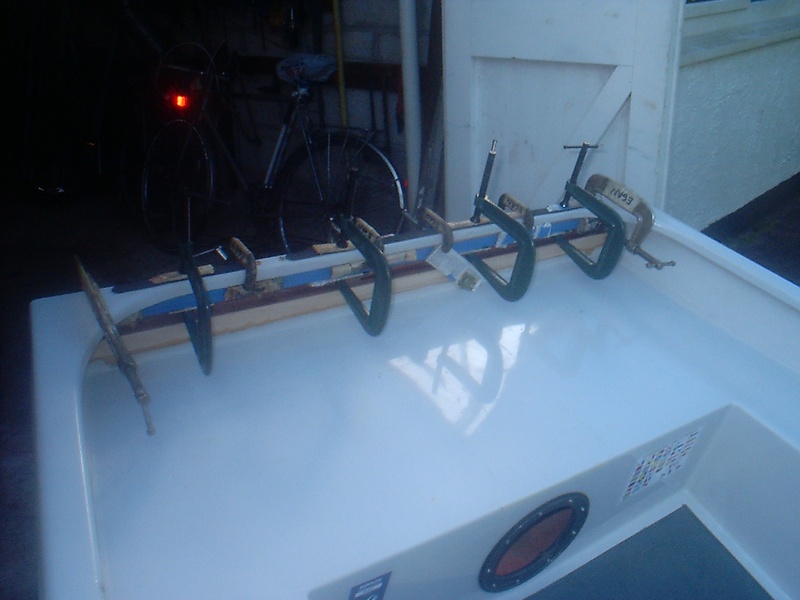 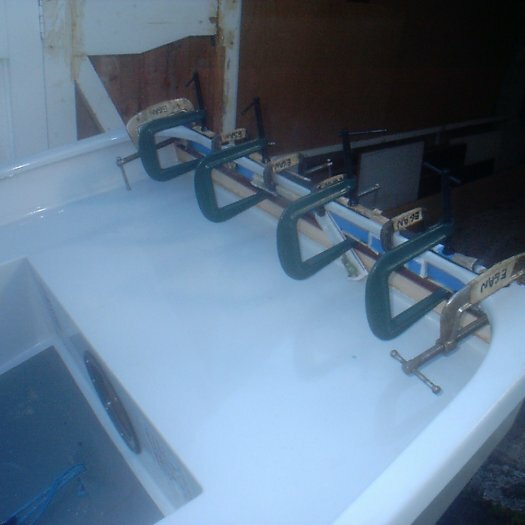 It was clear that the new doubler was going to have to be made in three parts, with the lower and upper parts slid into position and glued in turn and the central piece added last. 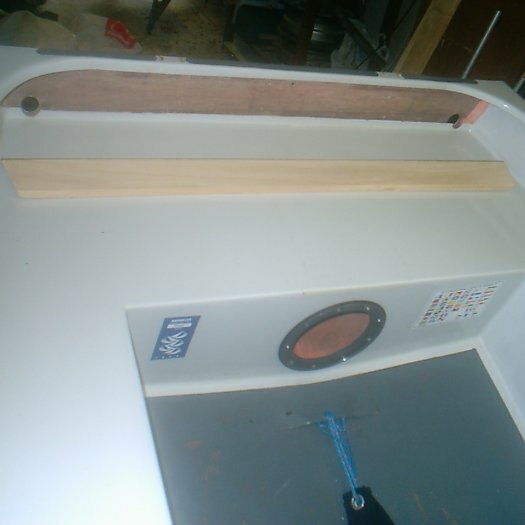 There was no way I was going to be able to hide the joins, so I decided to make them a feature by adding a narrow mahogany strip to the top of the bottom part and the bottom of the top part. 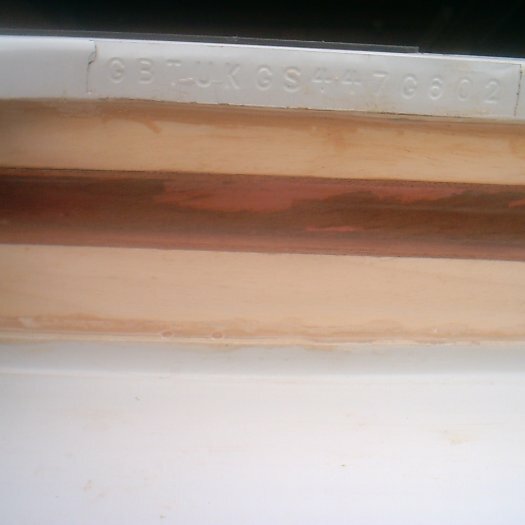 Mahogany would contrast well against the almost white obeche. 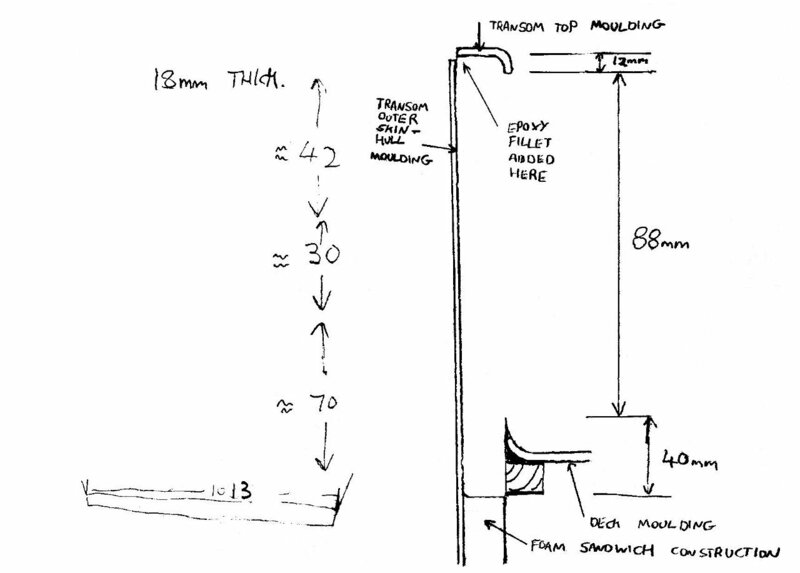 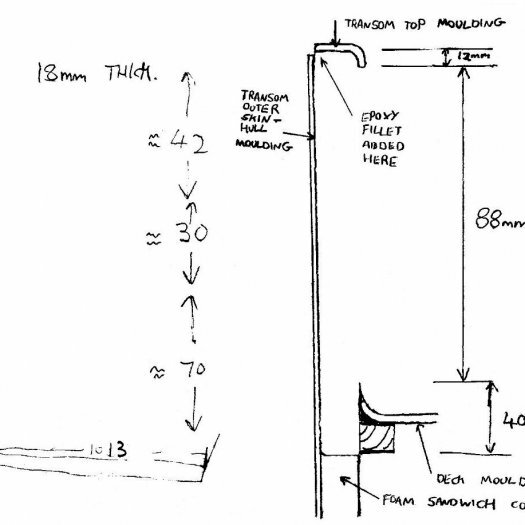 As you can see from the sketch, the visible part of the doubler would be 88mm deep. 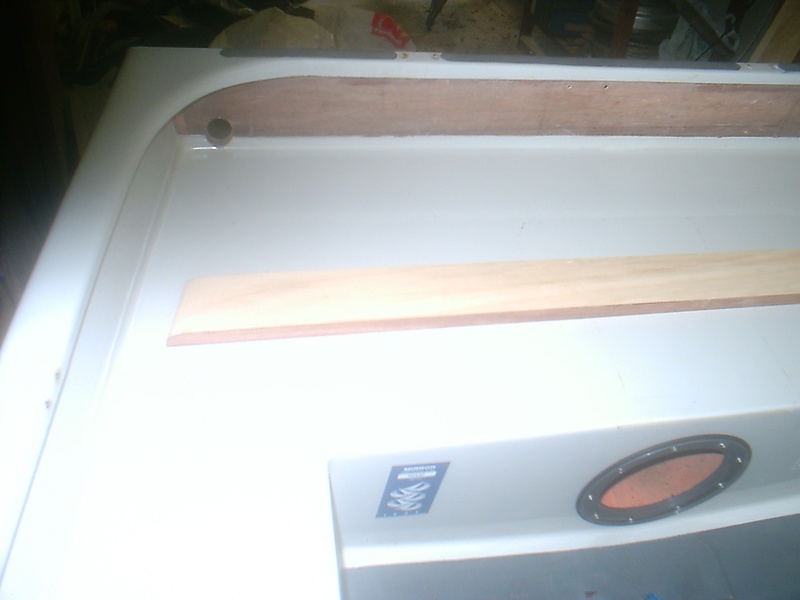 I decided to have each visible section equal in size, so that meant about 30mm wide. 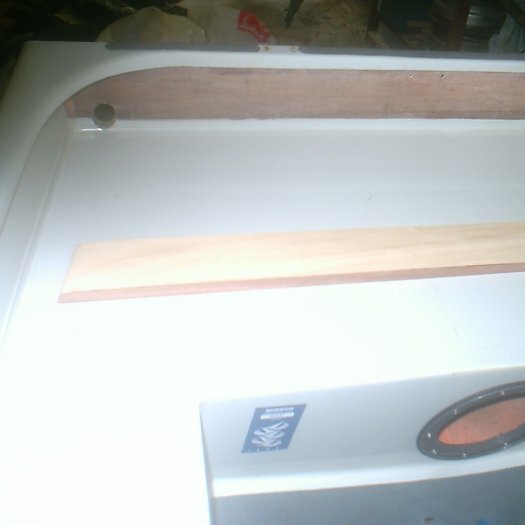 That meant the lower part of the doubler would need to be 70mm deep and about 18mm thick. 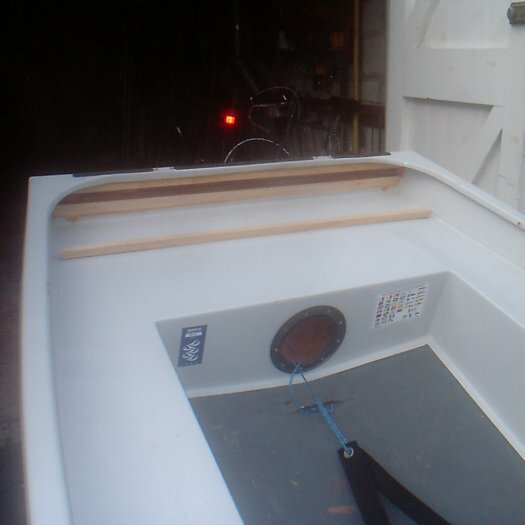 It was pretty time consuming to make and then to fit it to the hull. 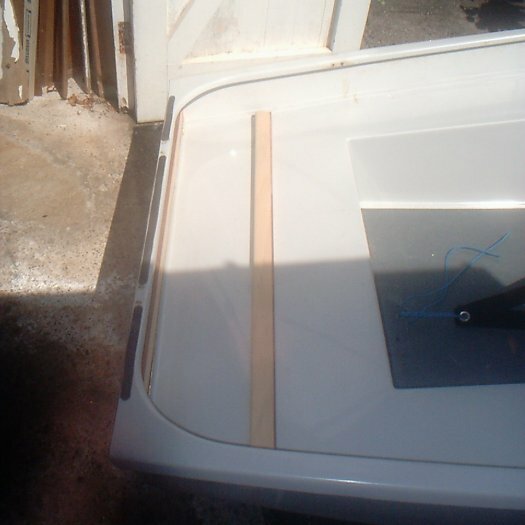 It had to be offererd up time after time to determine where it was too thick or too wide or not rounded enough. 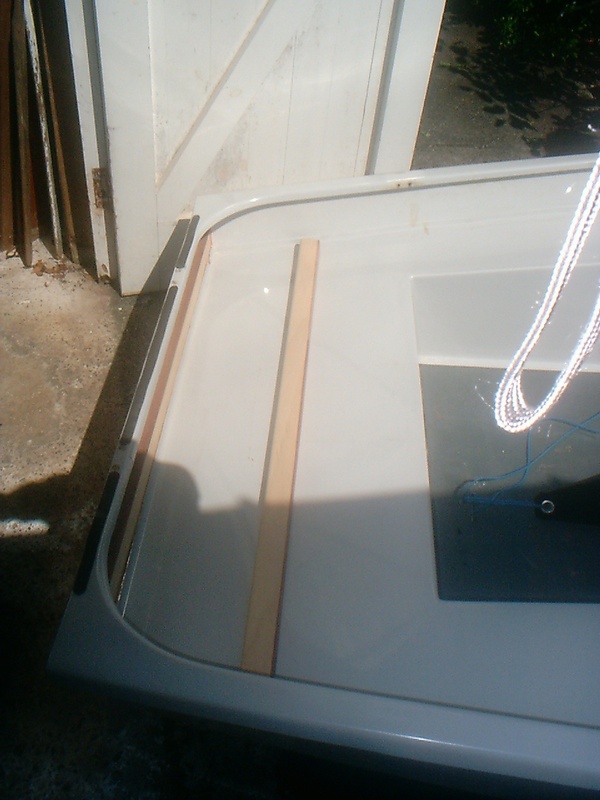 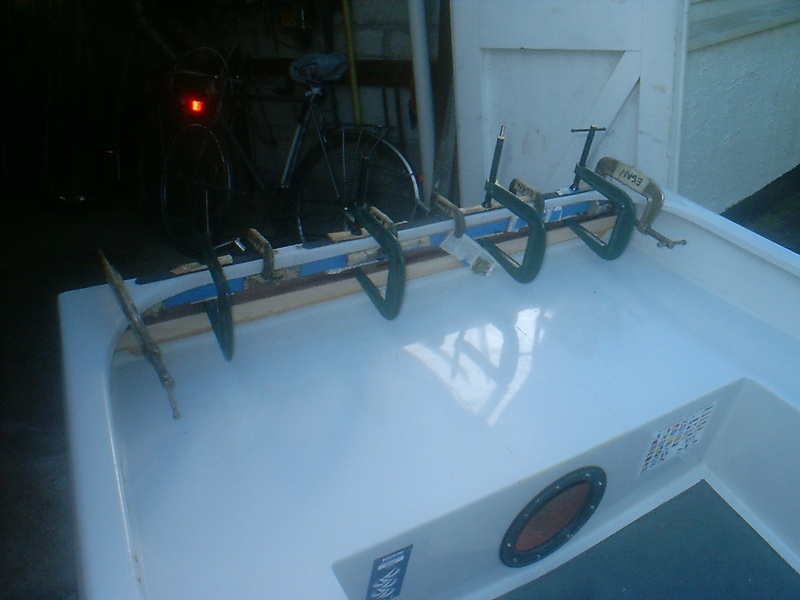 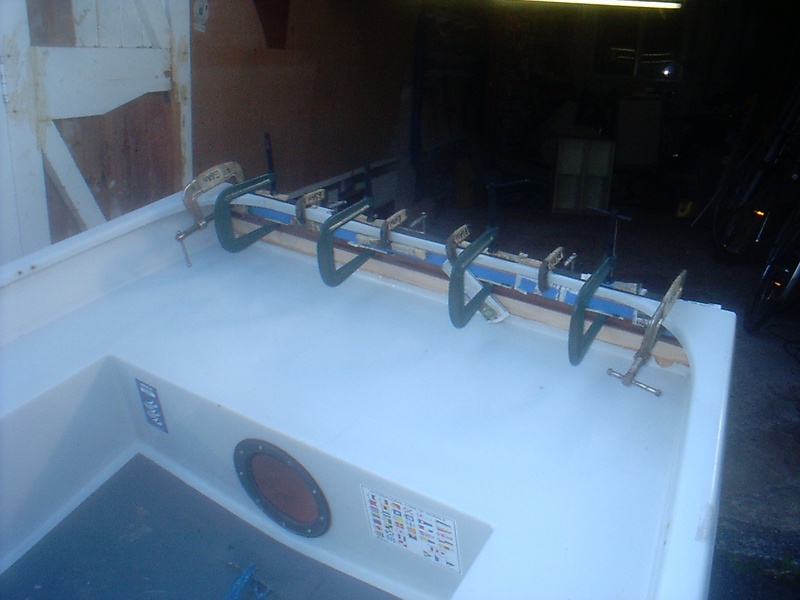 I put loops of sellotape around the doubler during this process so that I could pull it out of the gap between the aft deck lip and the transom. 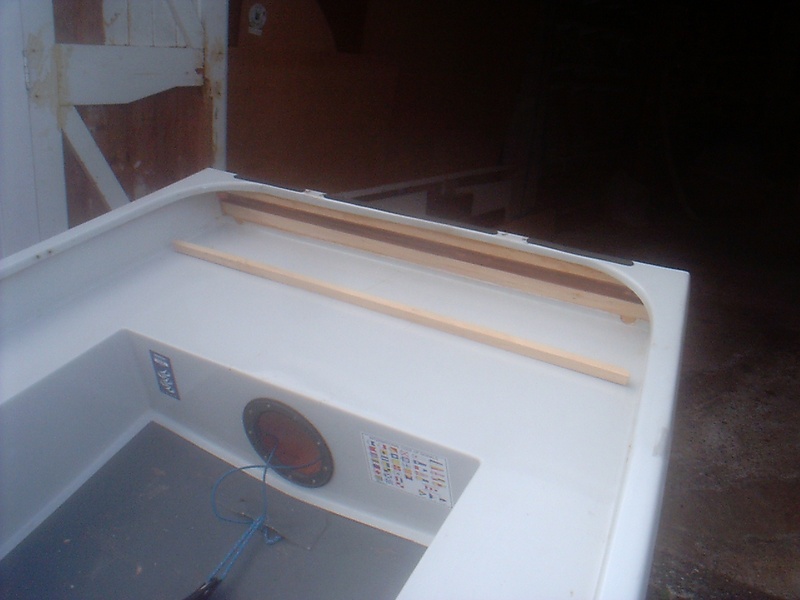 You can see from the photos that the aft edges on the angled sides are very rounded, this is so they mate with the curved surface of the join between the inside of the transom and the inside of the topside panels. 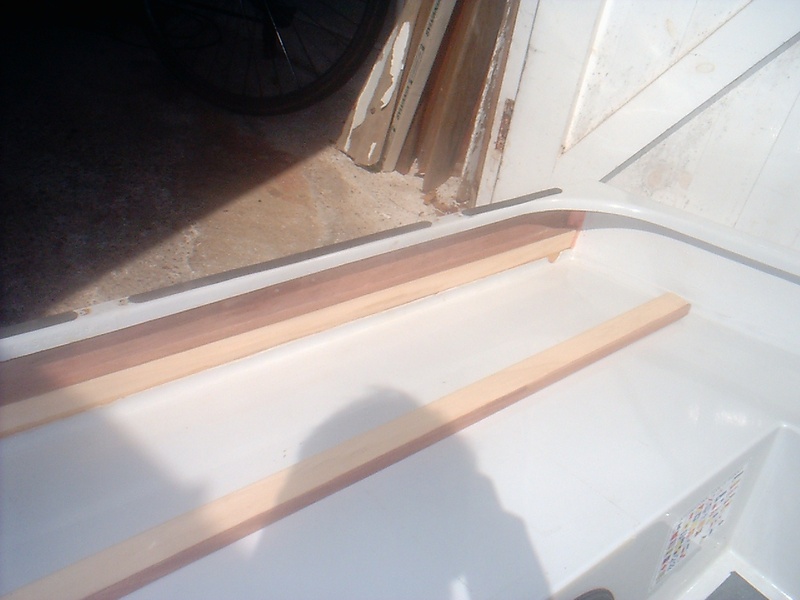 Prior to being glued into place I coated all the "hidden" surfaces of the lower part of doubler in neat epoxy resin. 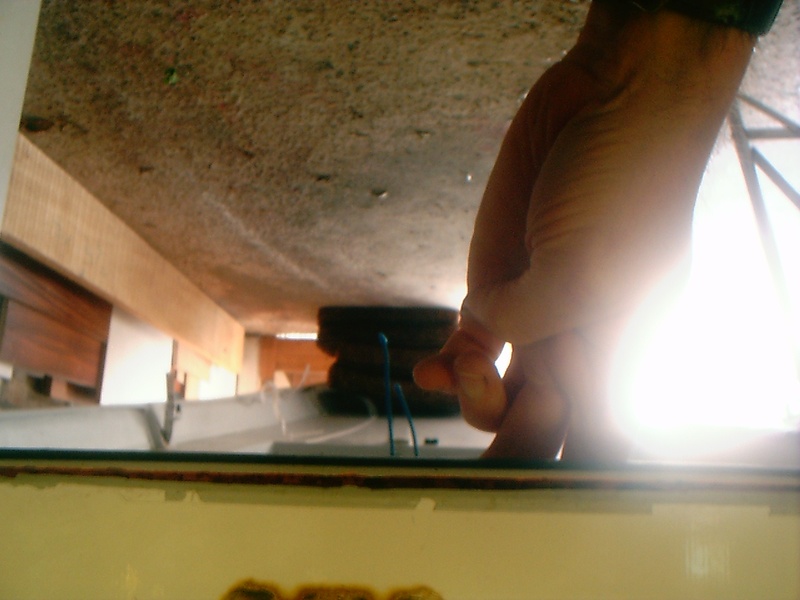 While it was still wet I then coated the surfaces to be glued with thickened epoxy. 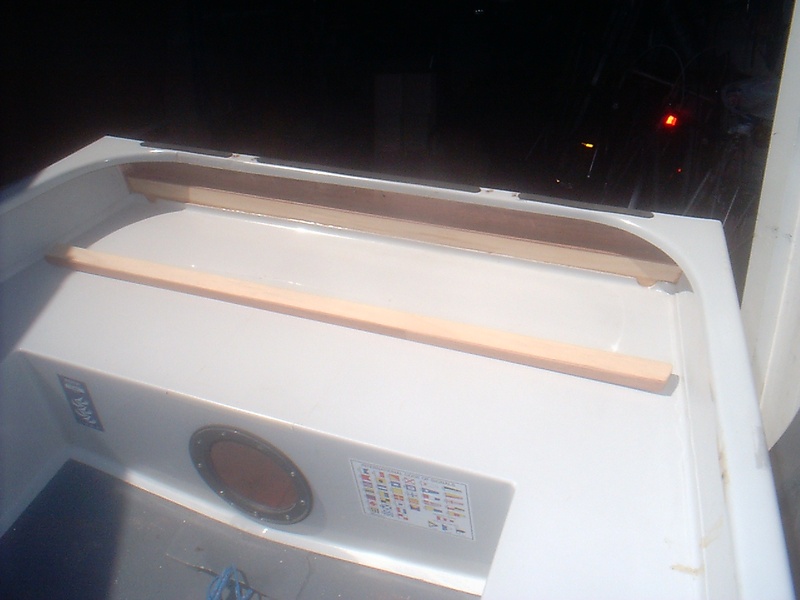 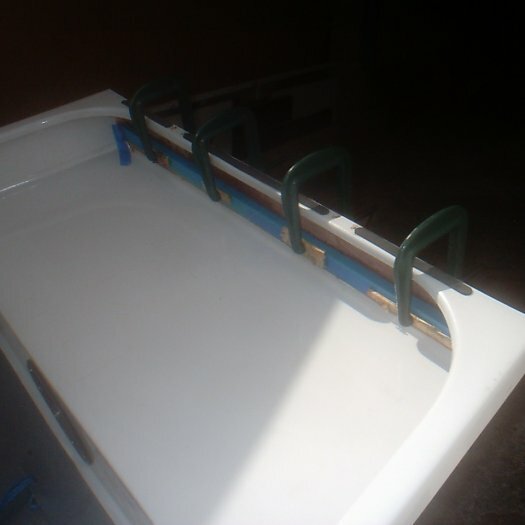 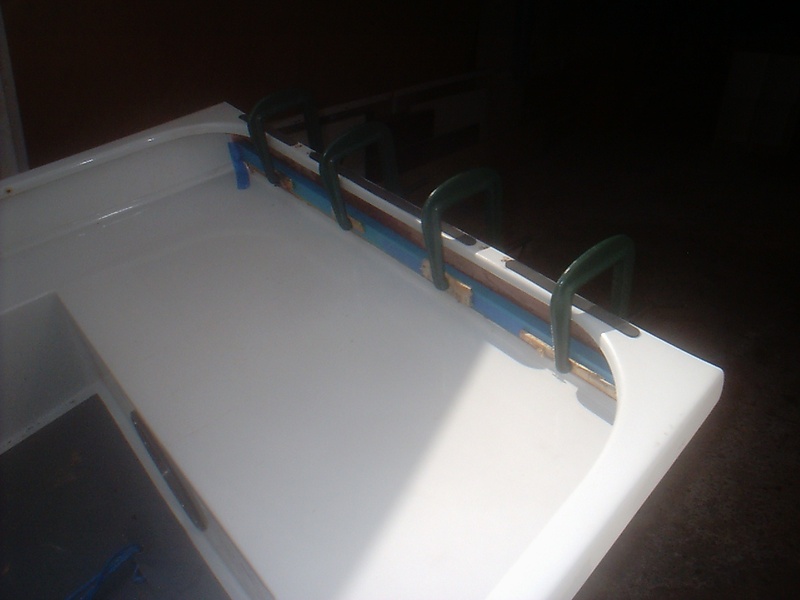 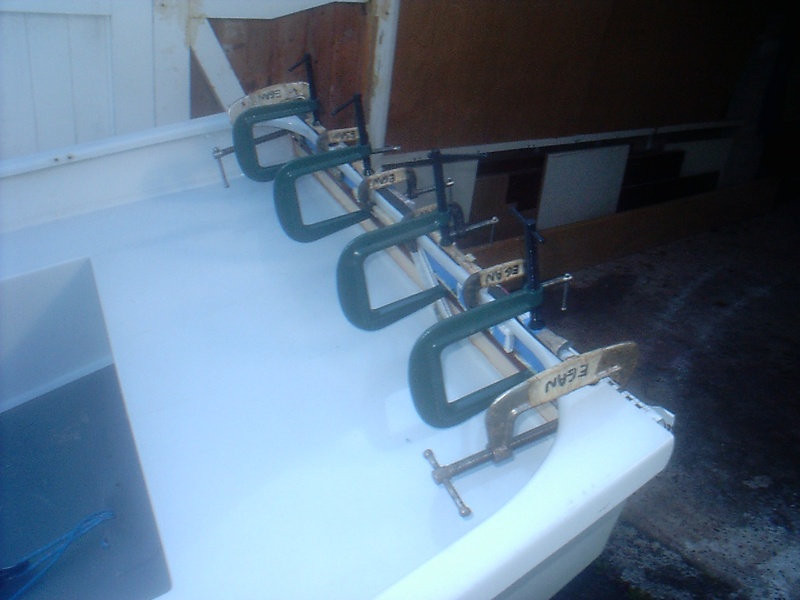 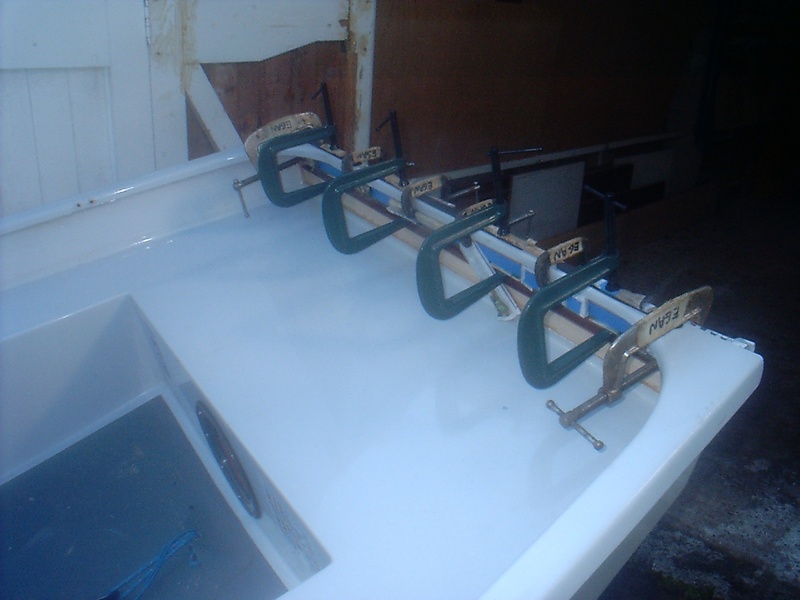 I also coated surfaces to be glued on the boat (i.e part of the inside of the transom, the moulded lip of the aft deck, the top of the foam sandwich constuction which the doubler was to sit on. 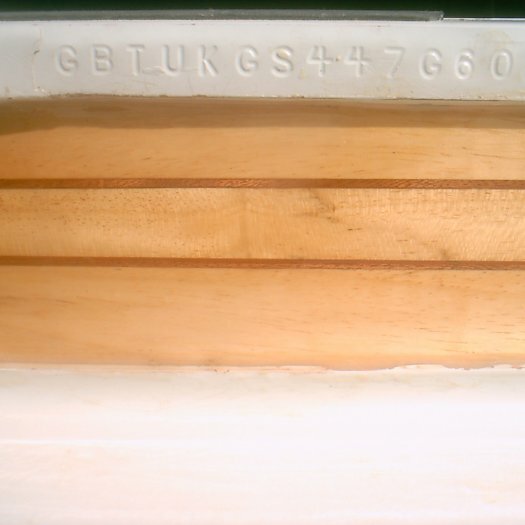 The visible surface was protected with masking tape during the gluing process. 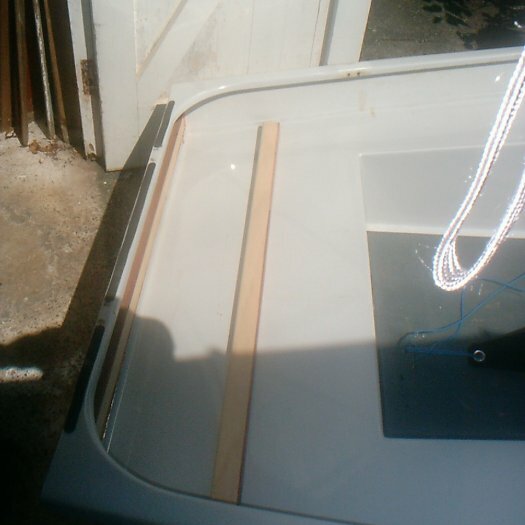 By the way, I'm not a fan of epoxy coating, but in this case the surfaces would not be exposed to UV light and was difficult to protect them in any other way. 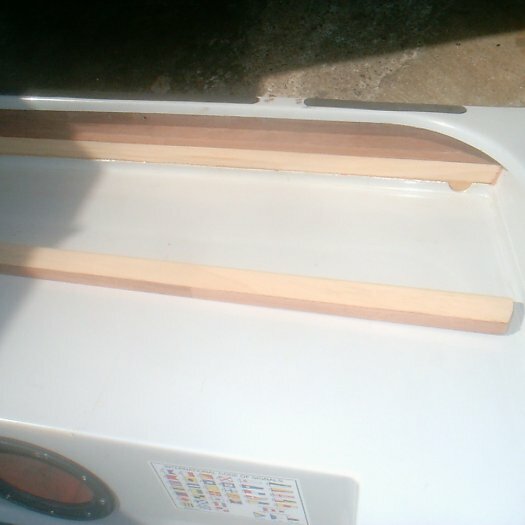 With the epoxy set I carefully cleaned up any glue which had squeezed out onto the top edge. 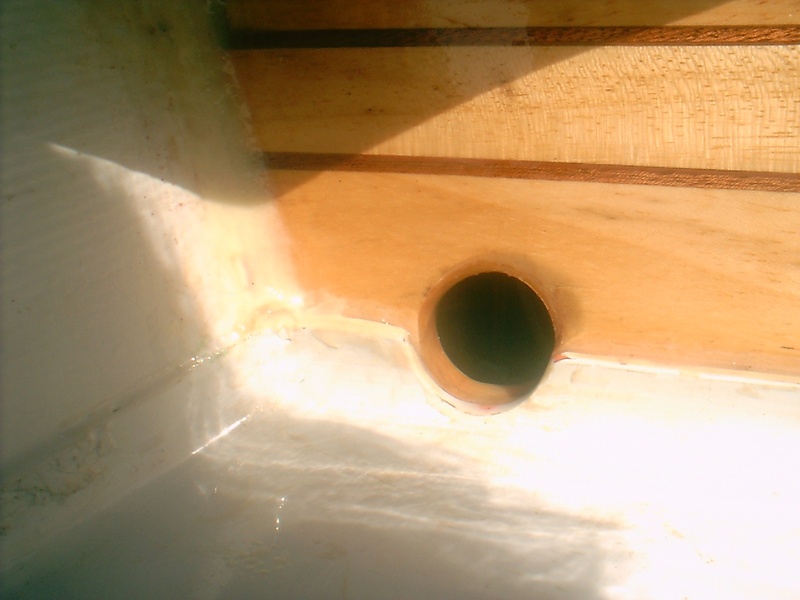 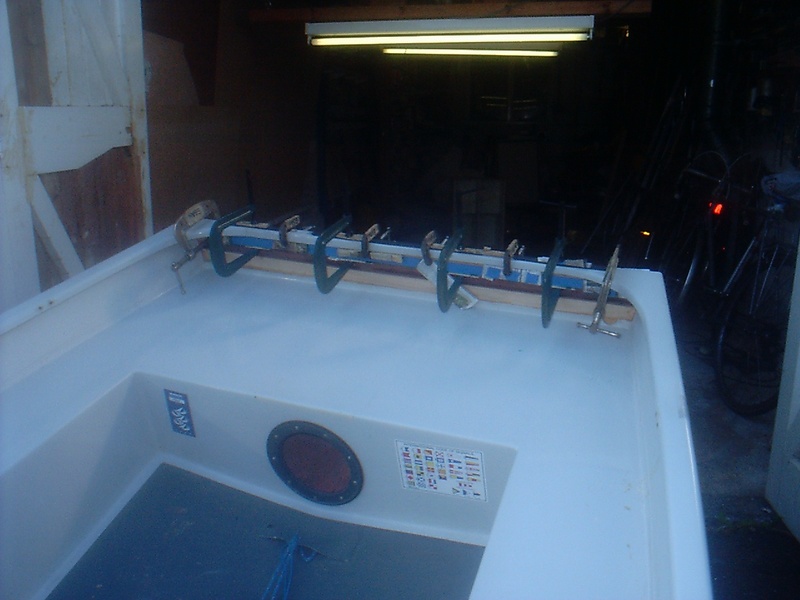 I also ran extra epoxy down into any remaining gaps at the sides or along the aft deck lip. 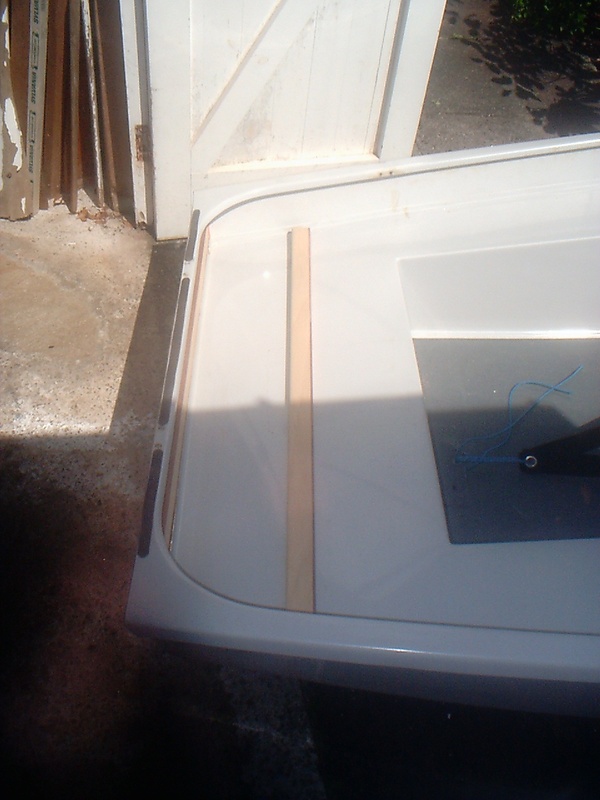 Next step was to make the top section, making, and getting this to fit was a similar process to the bottom section. 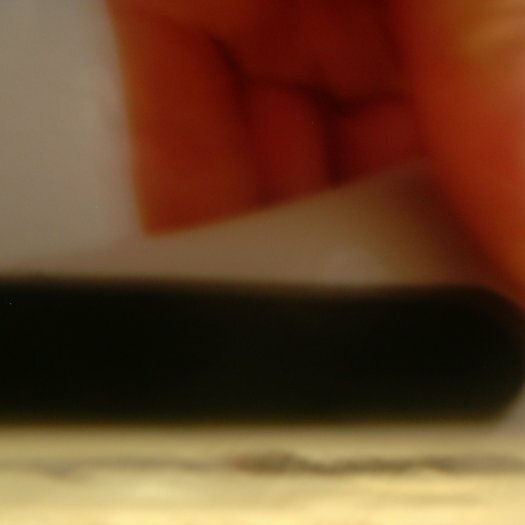 Once again, with the epoxy set, I carefully cleaned up any glue which had squeezed out onto the bottom edge. 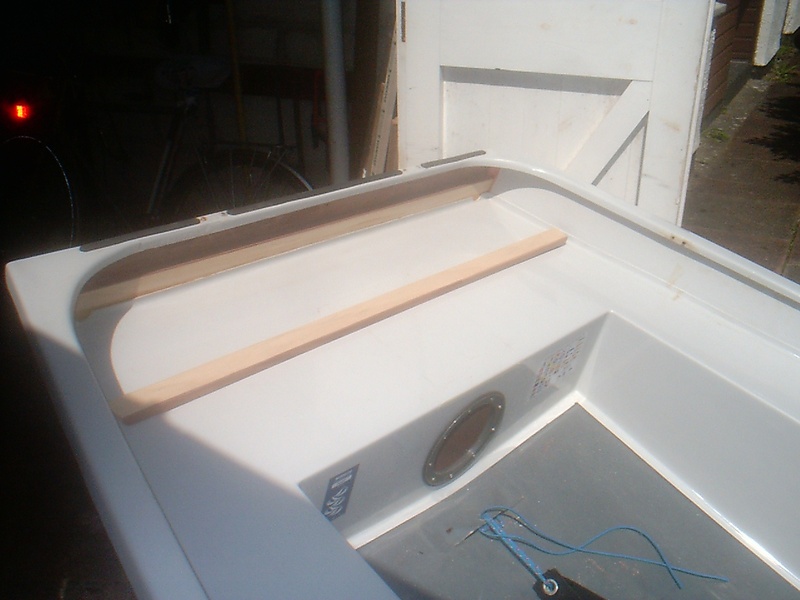 I turned the boat over so I could run extra epoxy down into any remaining gaps at the sides or along the transom top edge moulding. 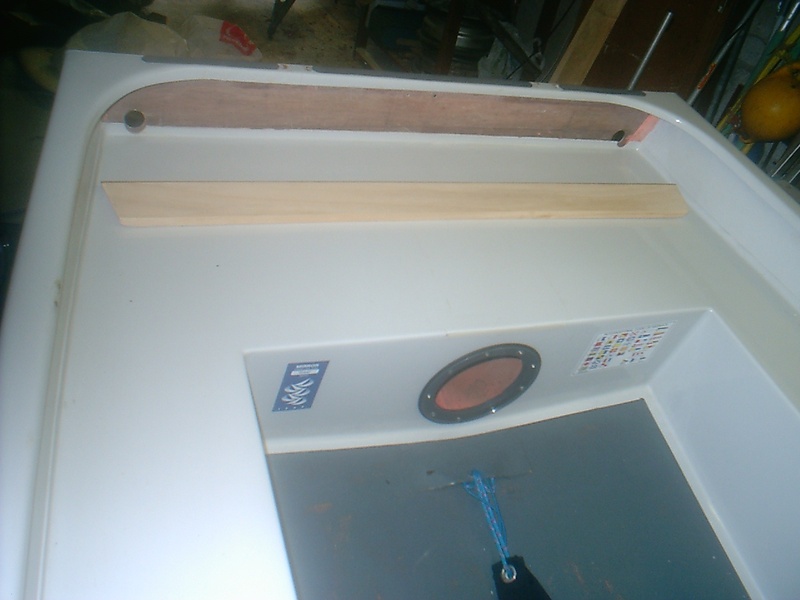 With the middle section glued in place I sanded the inside face of the transom flat. 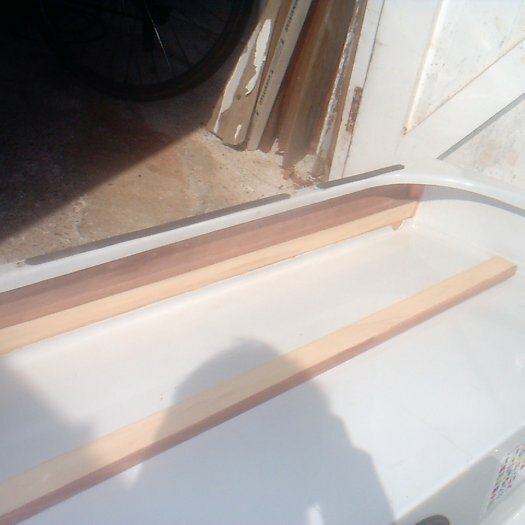 I used a mixture SP Microballons and thickened epoxy to fill any remaining gaps between the middle section and the ones either side. 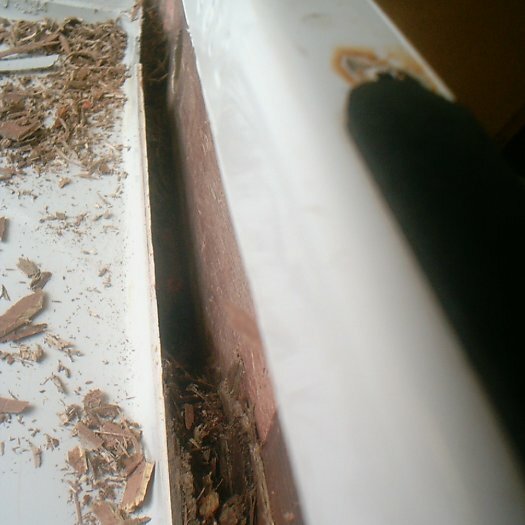 I put an epoxy fillet down each edge to make it look neater. 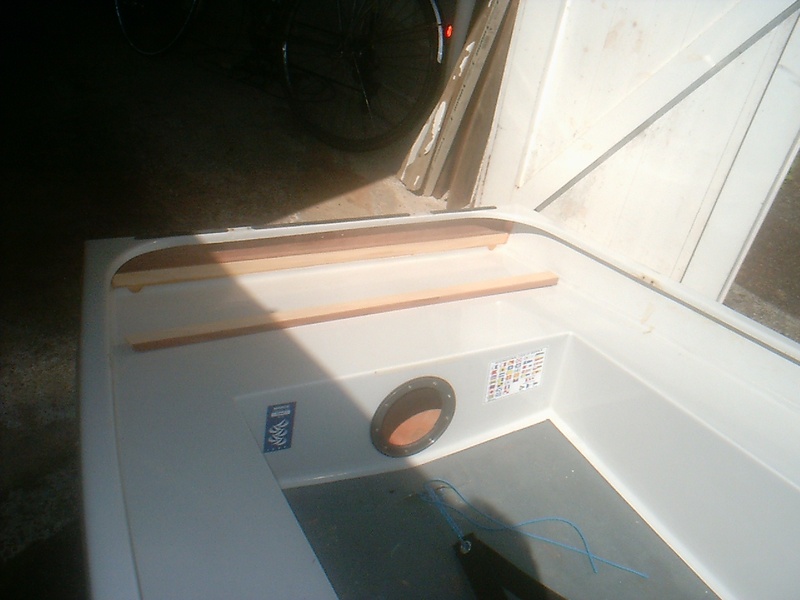 I then drilled the transom scupper holes, holes for the mainsheet attachment eyes and rudder fittings and varnished the doubler using about 10 coats of International Perfection Plus 2-pack polyurethane varnish taking care to varnish all the epoxy fillets and visible epoxy glue joins since epoxy needs to be protected from UV light. 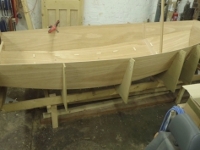 I'm very pleased with the result, but it has taken many many hours to do.